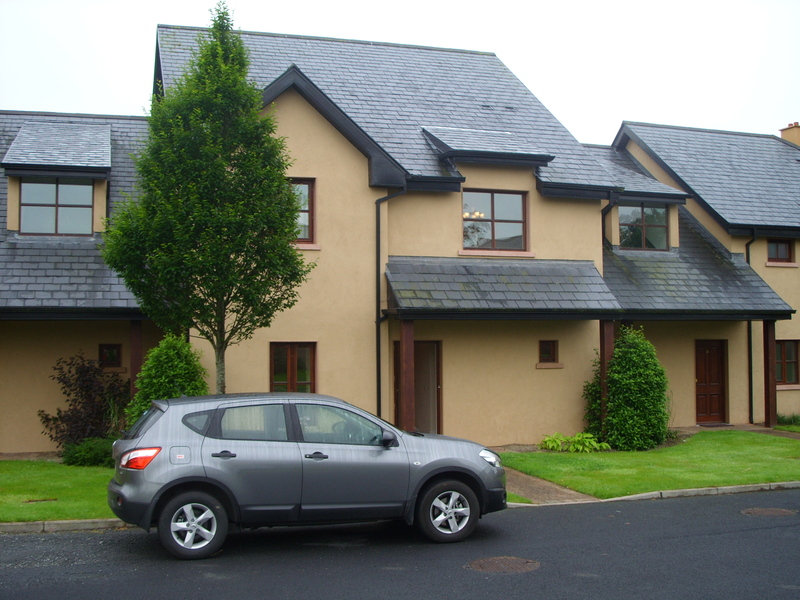 The plan for today was to drive to Cobh (pronounced “cove”) which is a small harbor town south of Cork. 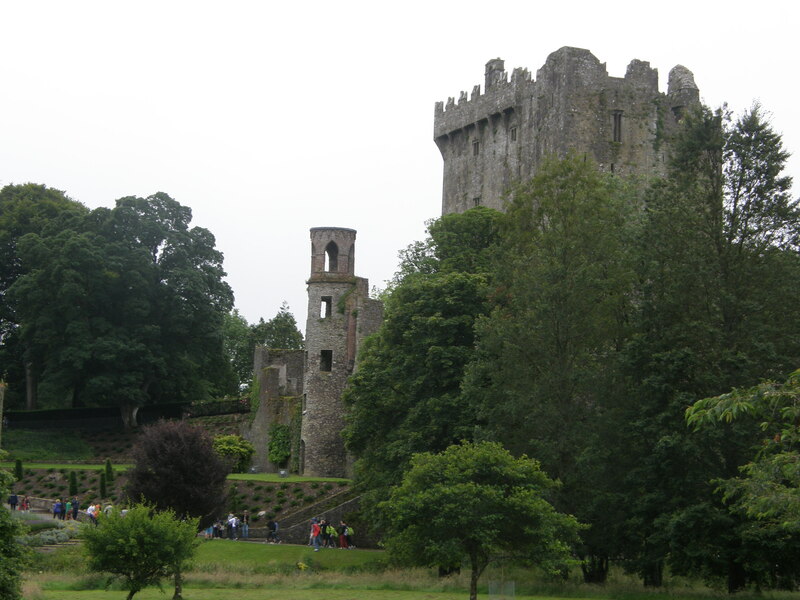 Blarney Castle just so happened to be along the way, so it seemed appropriate to make a pit stop there for the obligatory kissing of the Blarney Stone. As it turned out, Tom and Winnie didn’t really feel obliged to kiss the stone and weren’t really interested in seeing this castle in general. 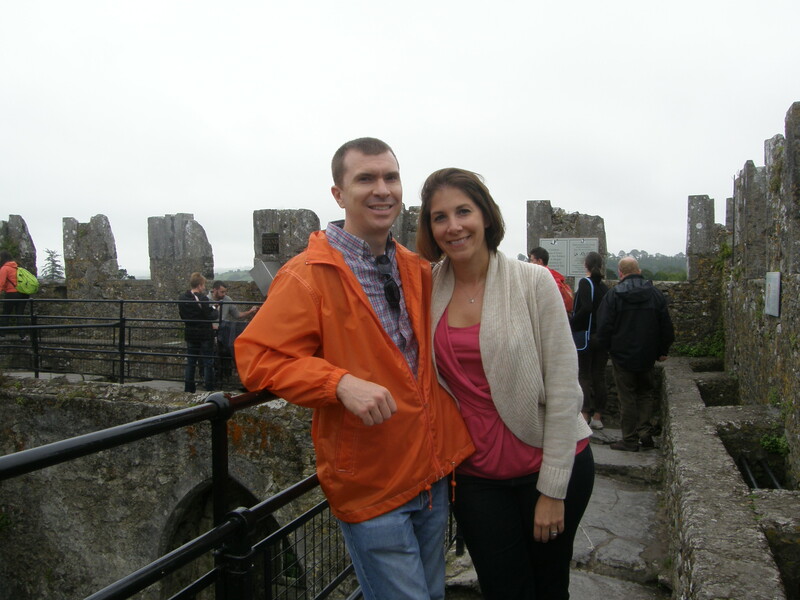 So they set off to do some walking around the town while Rob and I ventured onto the castle grounds. 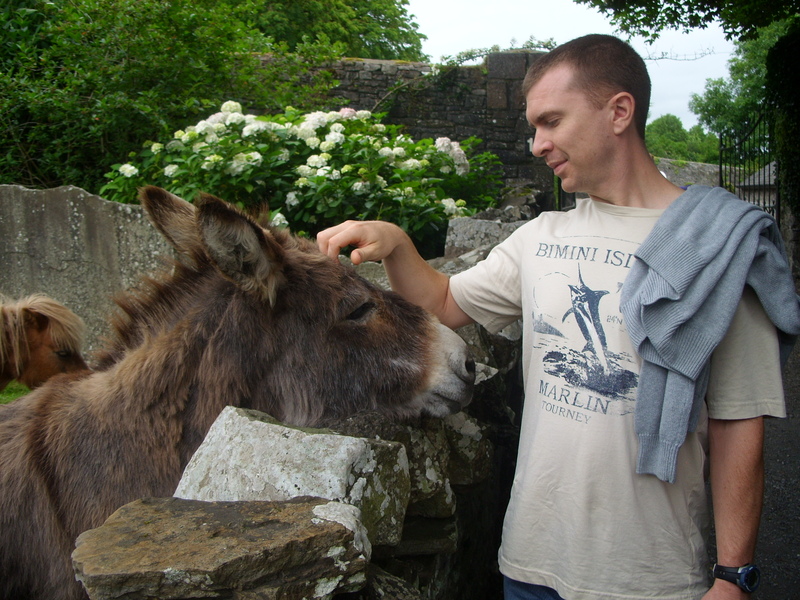 Rob had no interest in kissing the stone, but he went along to keep me company. In fact, he was actually kind of grossed out by the fact that I wanted to kiss the stone. Everyday, countless tourists plant a wet one on this stone and Rob wasn’t keen on swapping spit with any of these random people. I can’t say I blame him. I almost backed out of doing it myself because the thought of that was somewhat disturbing. But, in the end, this was something that I just felt I had to cross off my bucket list. 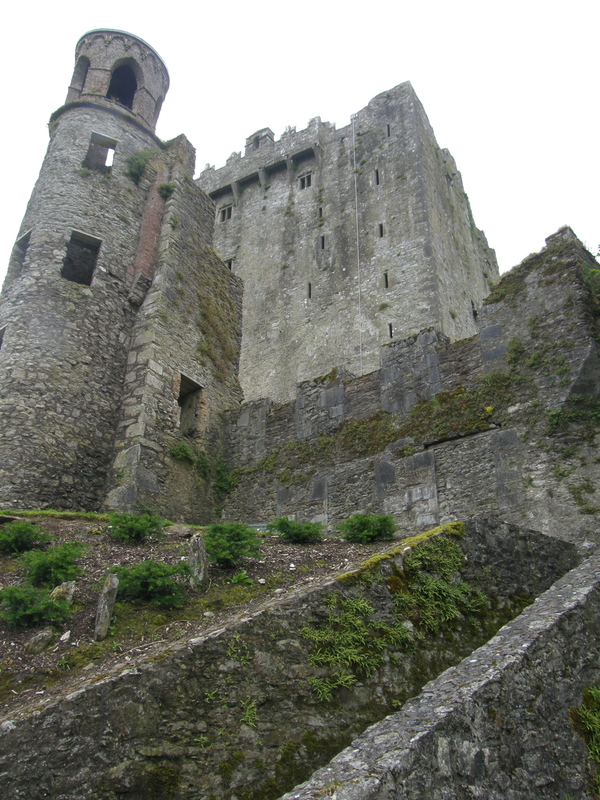 So I laid on my back, grabbed the hand rails and then tilted my head back and smooched the Blarney Stone. This, apparently, is supposed to give me the gift of gab. And at that point, Rob might as well have kissed the stone too because I was surely going to pass on those cooties to him anyway! But he held his ground and made me go wash my lips off at the nearest restroom. Even after that, he was hesitant to give me a kiss. With my bucket list a little shorter, we finished the drive to Cobh. Cobh was a really pretty town, but unfortunately, it was a dreary day outside. The skies were grey and it rained quite a bit. 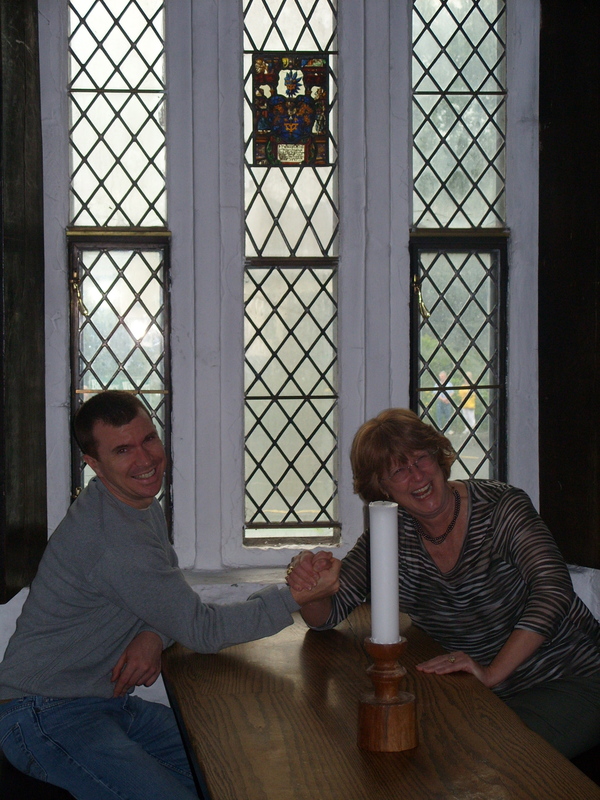 Unwilling to let the weather deter us, we started to explore the town which has quite a fascinating history. 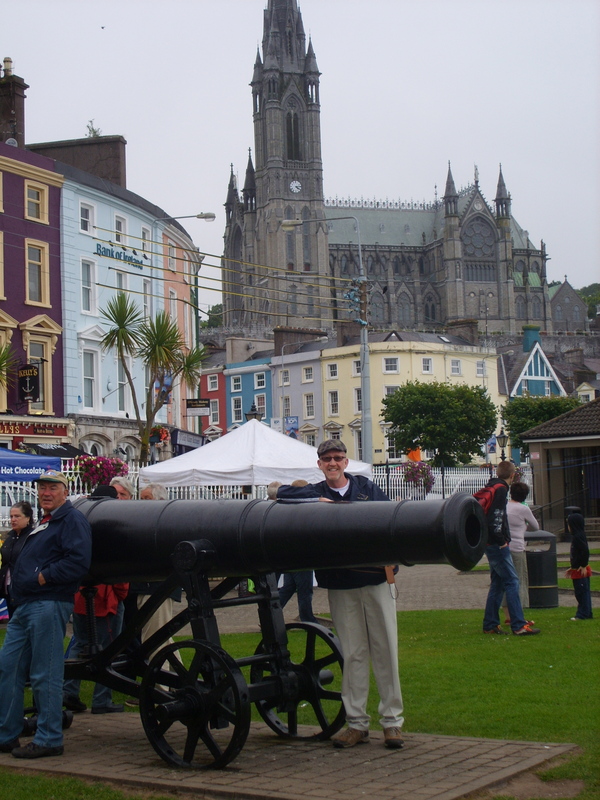 The town was first called Cobh in 1750 and kept that name for one-hundred years until it was changed to Queenstown to commemorate a visit by Queen Victoria. 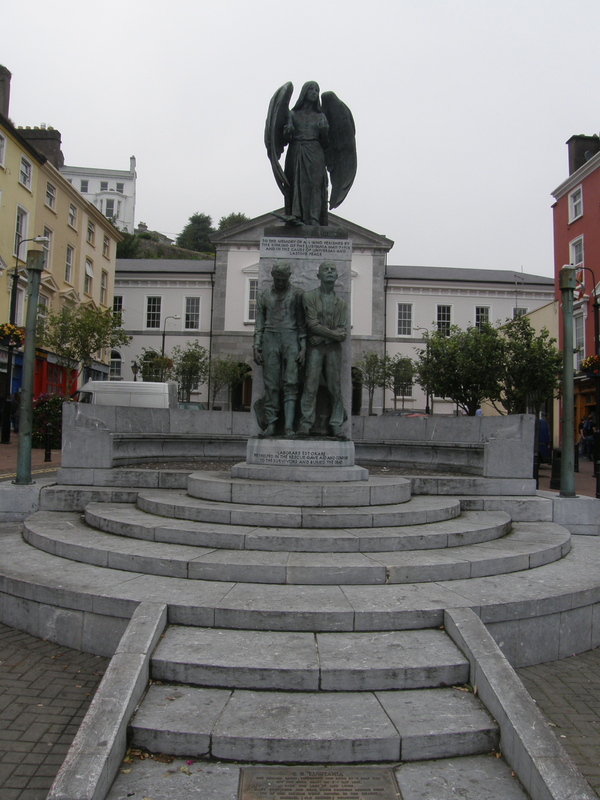 It kept the name Queenstown until 1922 when the name was changed back to Cobh with the foundation of the Irish Free State. Cobh is a major transatlantic port and it is where nearly half of the Irish emigrants departed from Ireland on their way to North America. 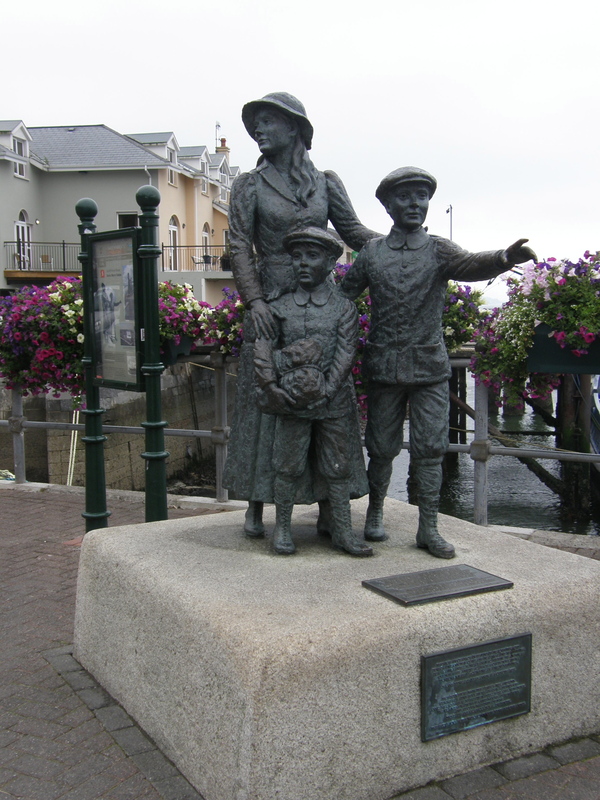 This statue along the waterfront is of Annie Moore and her brothers. 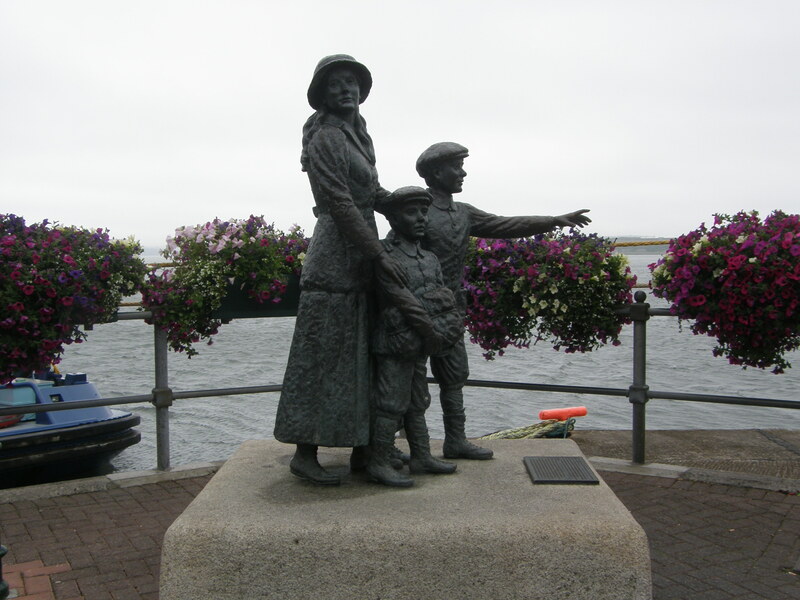 They emigrated from this port in 1892 and Annie Moore was the first recorded immigrant to process through Ellis Island. 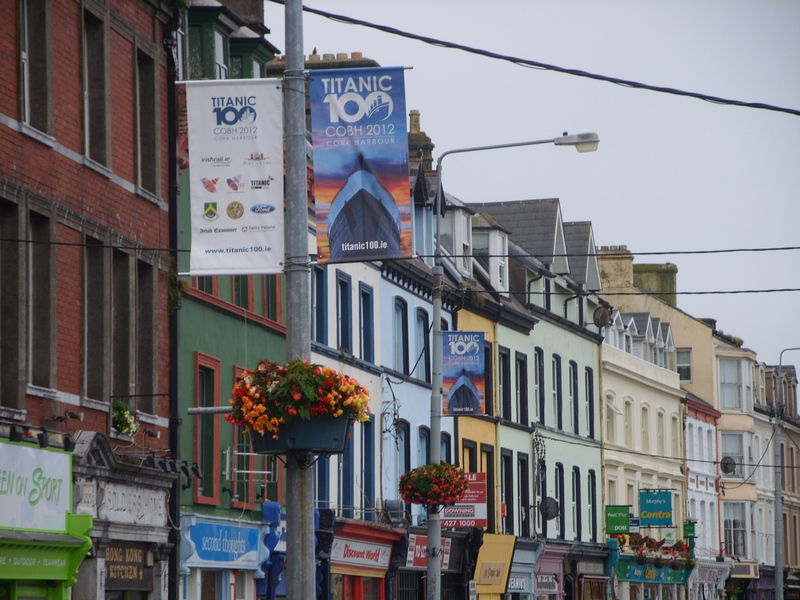 Cobh was also the final port of the Titanic before it set sail to cross the Atlantic. 123 passengers boarded the ship from this port. They entered through the White Star Line building and then boarded tenders which took them to the ship. Only 44 of these passengers survived. 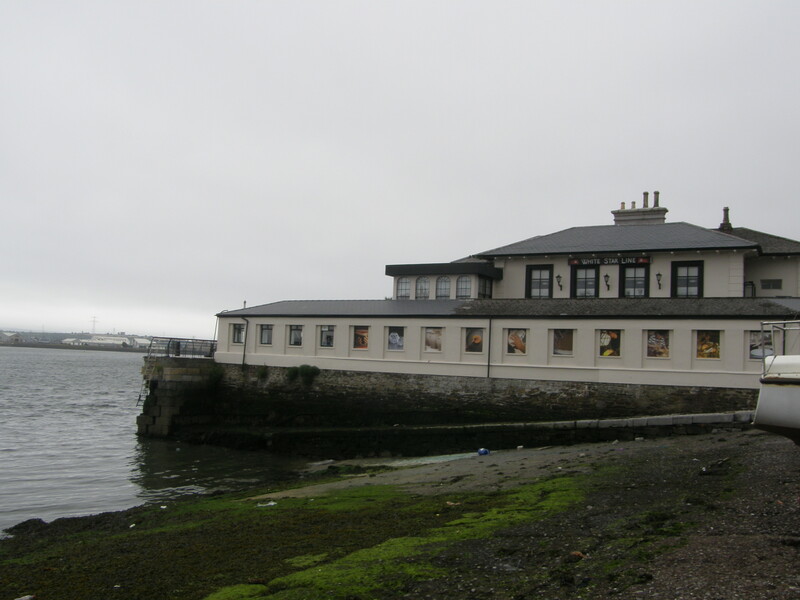 The White Star Line building is now home to a Titanic Museum. 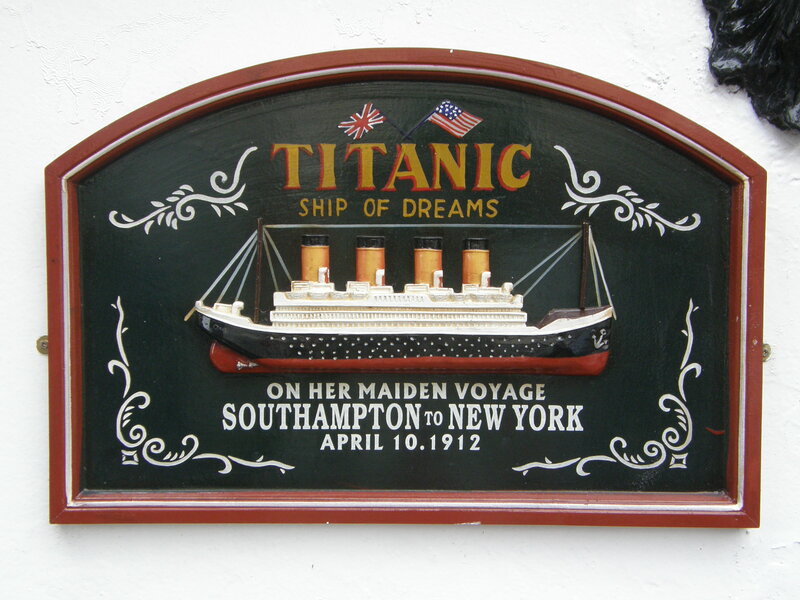 This year marks the 100th anniversary of the sinking of the Titanic. 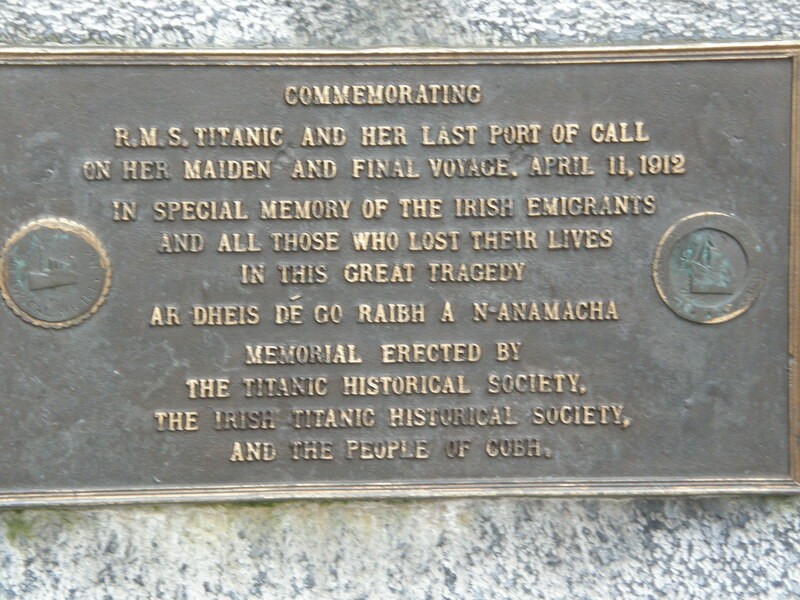 Plaques like these can be found outside businesses (and inside souvenir shops) all over Cobh. Another tragedy, the Lusitania was sunk by a German U-Boat off the Old Head of Kinsale while en route to Liverpool in 1915. 1,198 passengers died, while 700 were rescued. 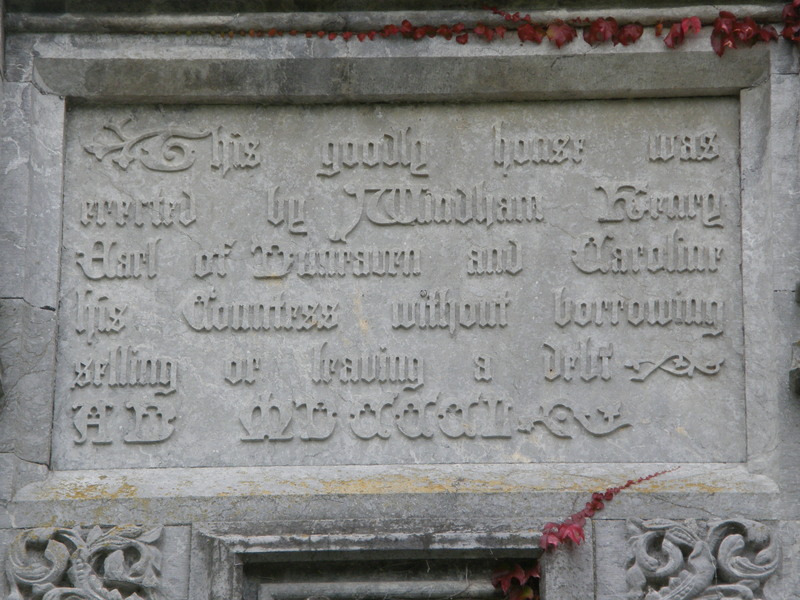 The survivors and victims were brought to Cobh, and over one hundred lie buried in the Old Church Cemetery just north of the town. 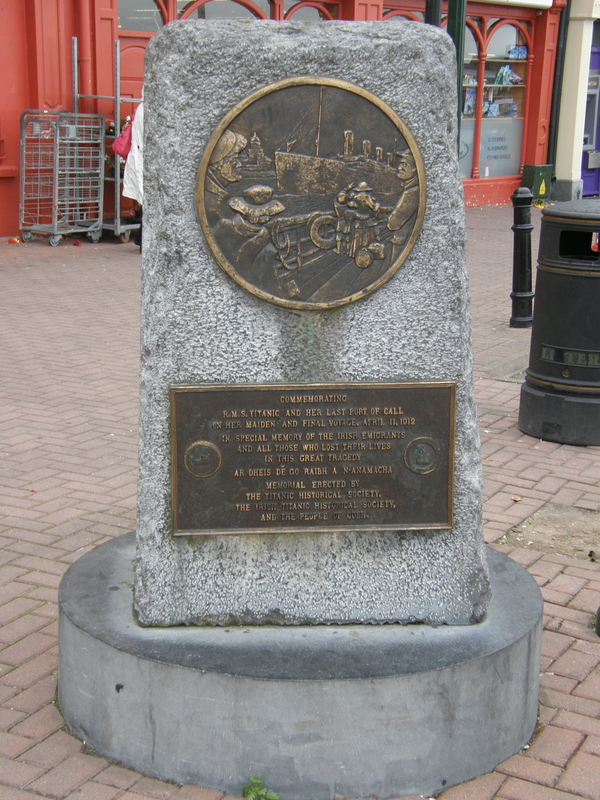 The Lusitania Peace memorial is located in Casement Square. 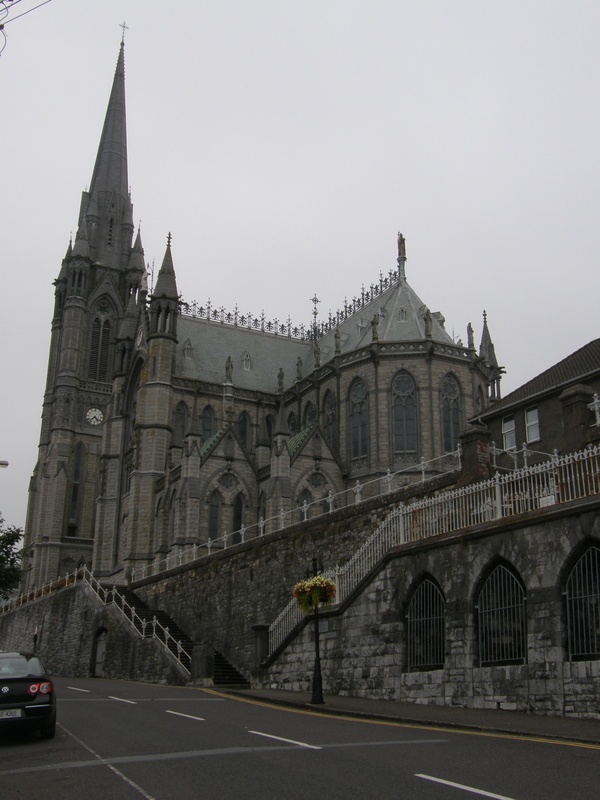 St. Colman’s Cathedral sits on a high point in the town and it is one of the tallest buildings in Ireland. While we were there, we were able to hear the carillon church bells being played. 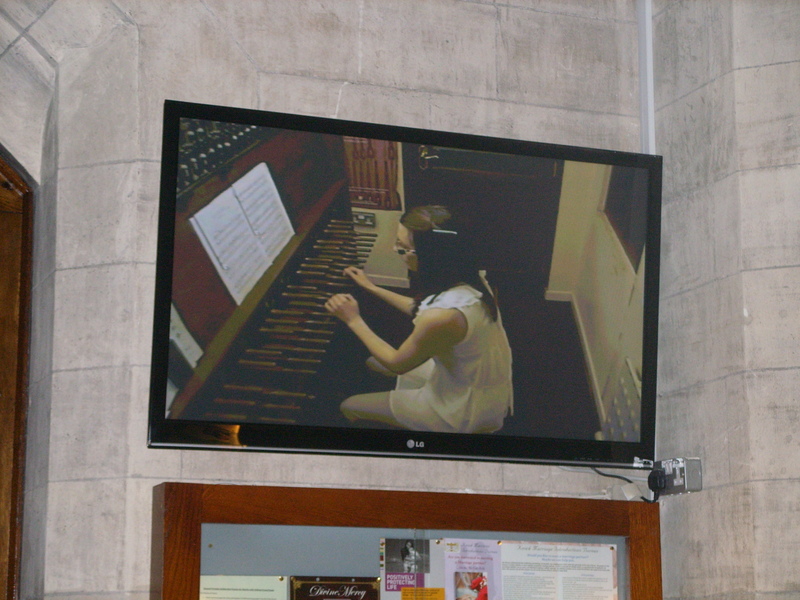 The music was wonderful and after a short walk up the hill and into the church we were able to watch the woman playing the carillon live via a video screen. The batons (keys) of the carillon are arranged similar to the keys on a piano. However, she had to exert far more energy to strike the batons than a pianist would have to, to hit the keys of a piano. It required the palms of her hands or even fists to press the batons. 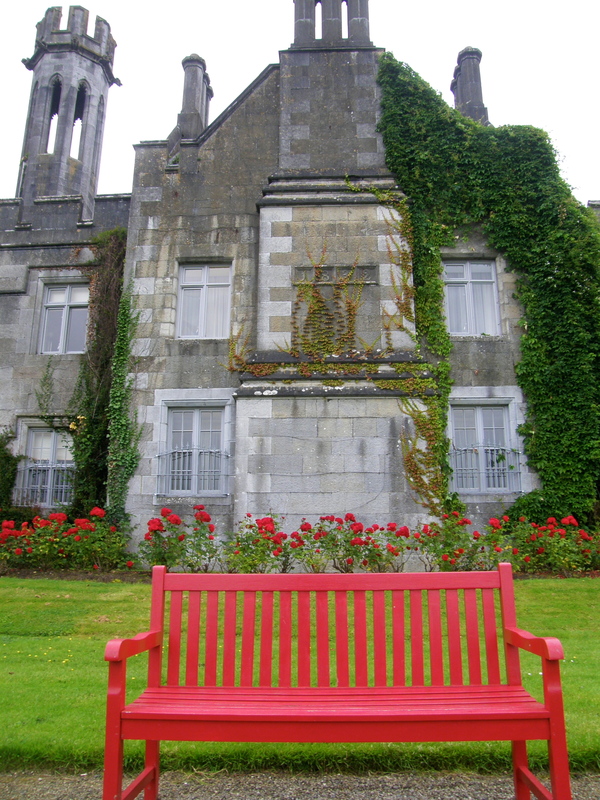 After the carillon was doing being played, we left Cobh and headed back to Adare. Rather than going out to a pub again, we decided to find out what Chinese food tasted like in Ireland. For some silly reason, I have always gotten a kick out of the fact that they call it “take-away” rather than “take-out.” So, in order to get the full experience, I wanted to order take-away. 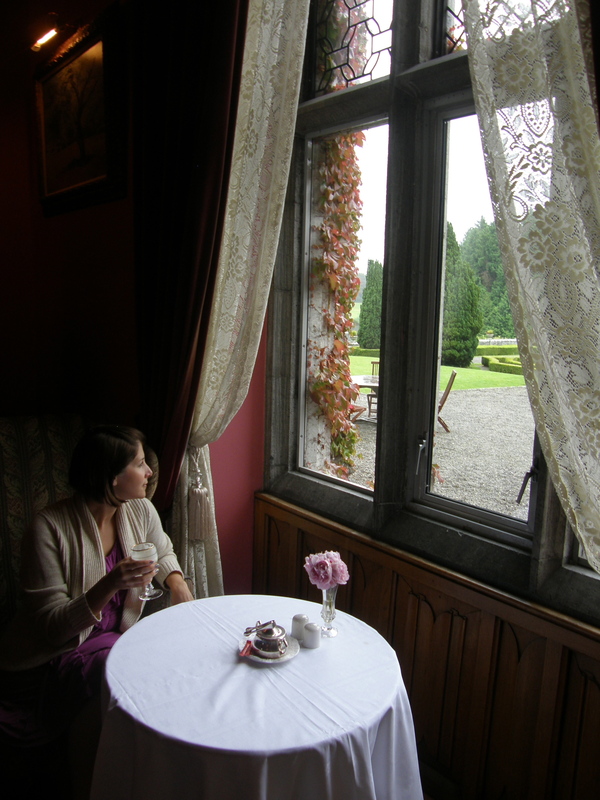 We found a menu online for the Golden Dragon in Adare and then we went to pick up our take-away. It was pretty similar to Chinese food at home, but I think I like our Chinese take-out a bit more. Besides, they didn’t give us any fortune cookies; just these weird styrofoam-looking cracker things. Now that I think about it, we probably should have taken a picture of those. Posted on August 4, 2012 by Dayna B. 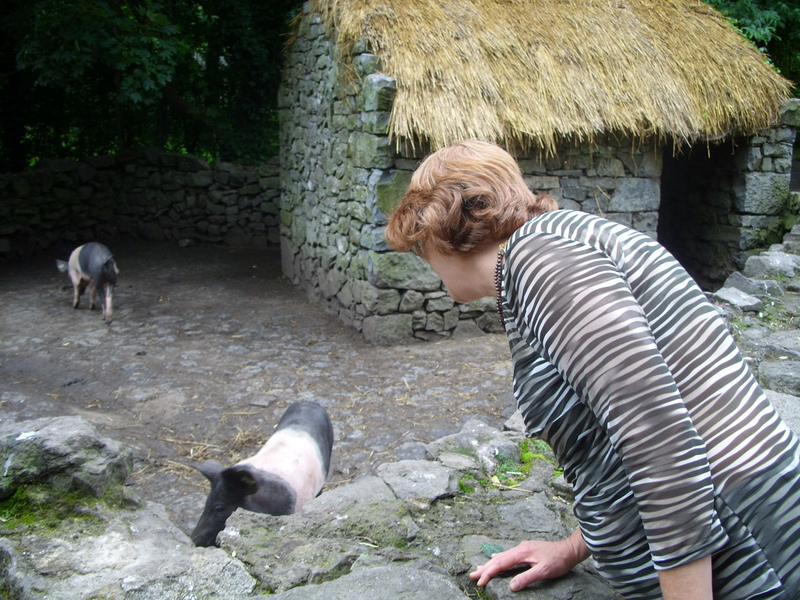 Next, we headed to Limerick, which was not far from Adare at all. We stumbled upon a wonderful breakfast café where all the locals seemed to go and the waitress knew everyone’s name. 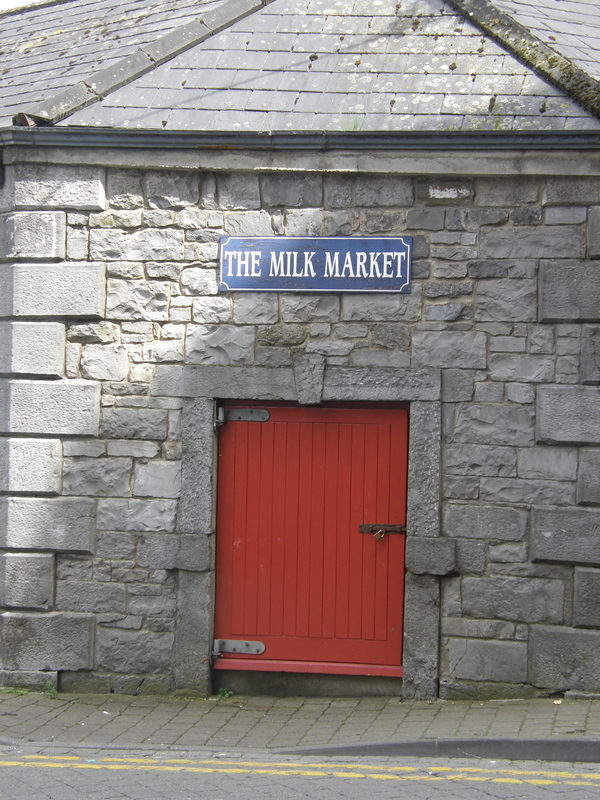 After breakfast, we were in search of the Milk Market which we heard was quite fabulous. The rumors were true! There was vendor after vendor of cheeses, breads, sweets, and other prepared foods, as well as flowers, clothes and crafts. We were all almost drooling over all the goodies and if most of the stuff didn’t require refrigeration, I am sure we would have loaded up on purchases. Instead, we decided this would be an ideal place to come back for lunch later (I really wish I would have gotten some pictures inside the market). 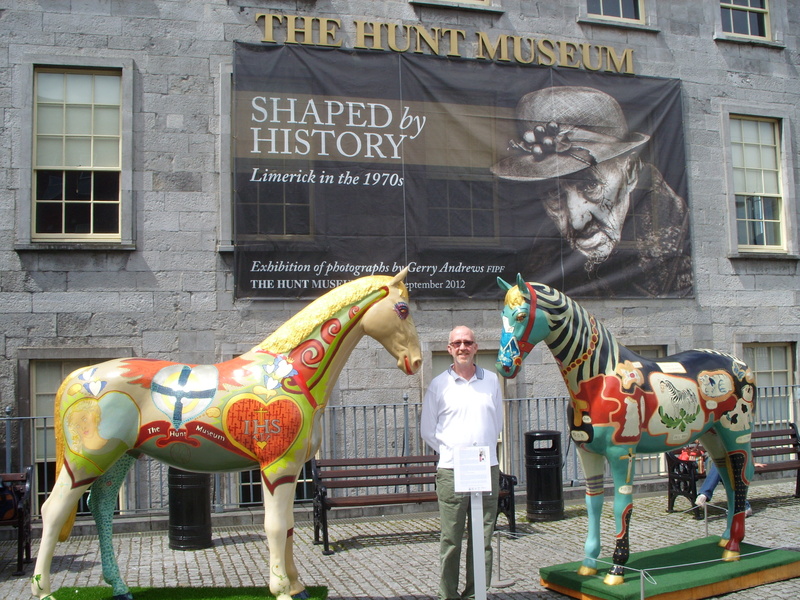 In the meantime, Tom and Winnie really wanted to go to the Hunt Museum and King John’s castle. Neither of these places were really high on my list of things to see, but I just went with the flow and followed the group. 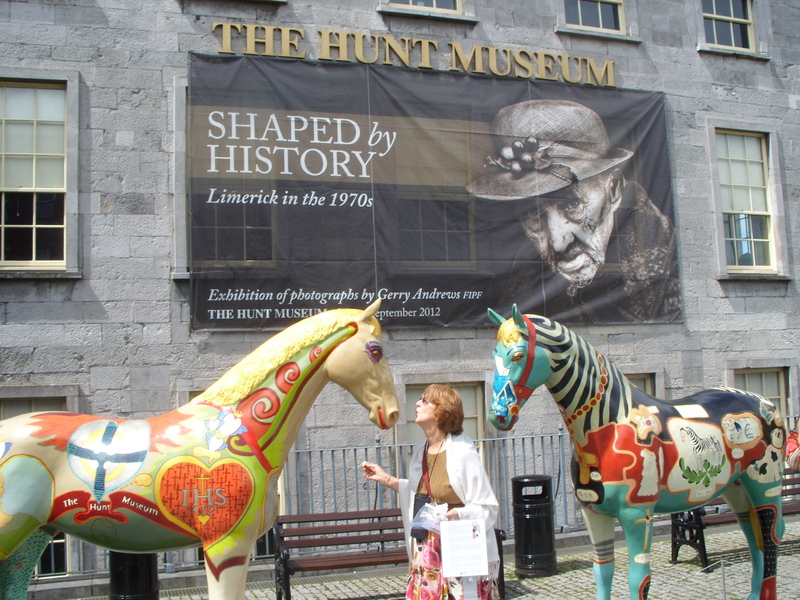 The first stop was the Hunt Museum. I had never heard of the Hunts before, but I guess they fancied themselves as “collectors” (I prefer the term hoarders). The museum was 3 floors of all the “treasures” (a.k.a. junk) they have collected for several decades. One notable piece spotted by Rob was a regular dinner fork with a description card that said “20th century, stainless steel utensil, originating from Asia.” Imagine that….a common dinner fork, made in China, now in a museum pretending to be something more than ordinary. Ok, enough sarcasm about the museum (I just can’t help myself sometimes). Tom and Winnie enjoyed it and that is all that matters. 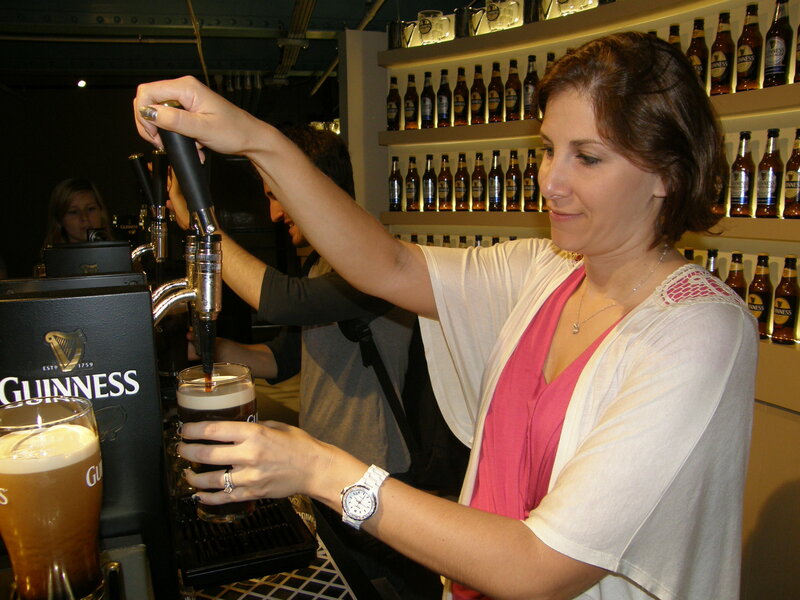 Me…I should have saved my 5 euros for a pint! The next stop was King John’s castle. 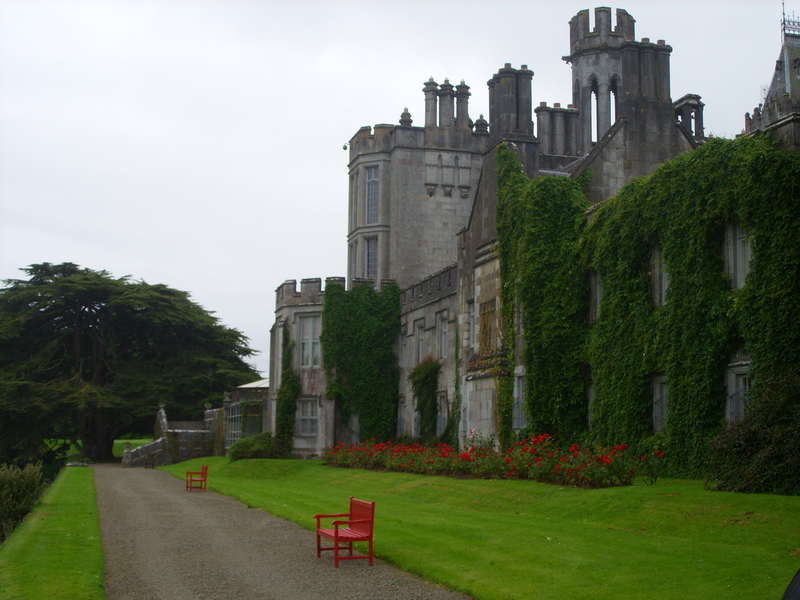 Usually, I find castles very interesting and worthwhile to visit. 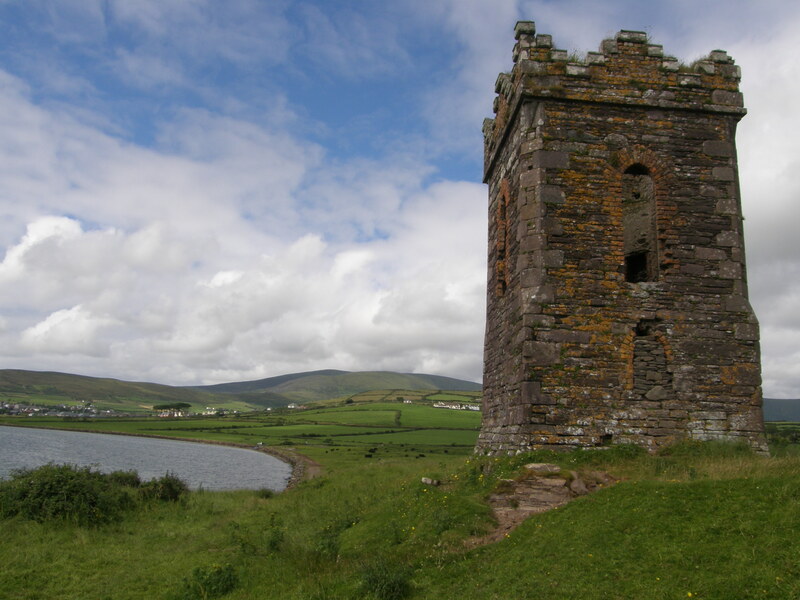 But for some reason, this castle was completely underwhelming to me. And at the rate of 9.50 euros to see it, I was not really that interested. 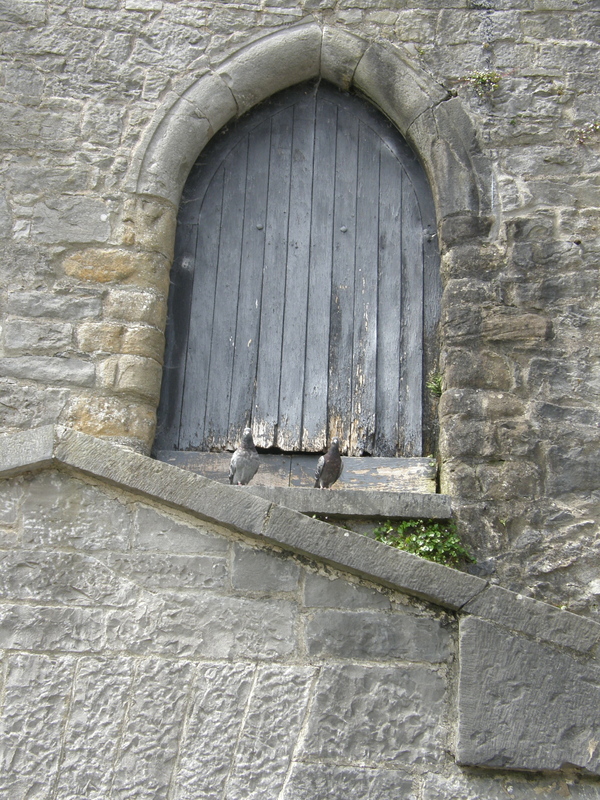 I walked the castle grounds looking for good photo ops to make this stop a little more enjoyable, but all I could find were these two pigeons. 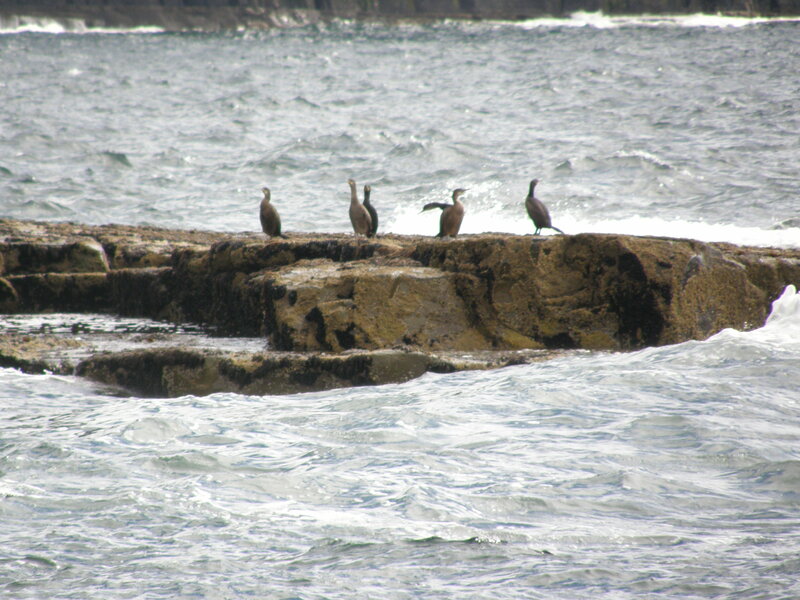 I am not sure why, but they seemed to be the only things interesting to me at the time (they kept staring at me!). 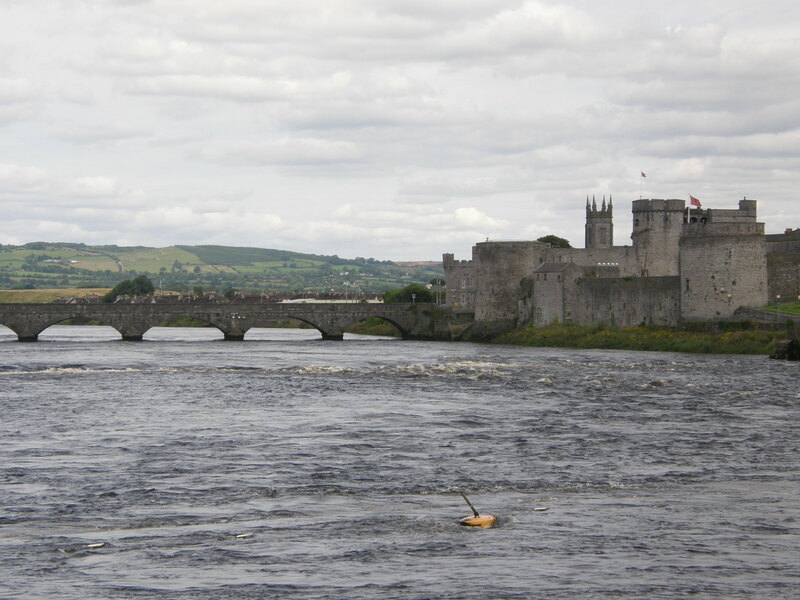 I would have been content with only this exterior view of the castle on the River Shannon (and saved my 9.50 euros for 2 more pints!). In my opinion, it was much more interesting from afar. After the castle tour was complete, we high-tailed it back to the Milk Market to get the lunch that we had been thinking about all morning and well into the afternoon. But we were too late. The market was over and the vendors had packed up and left. Damn you King John!! I had my heart set on these beautiful stuffed mushrooms and they were gone. Here is the part where I have to admit that I started to get a bit grumpy. You would completely understand had you seen the food in this market. We found somewhere else to eat lunch and then we headed back to the villa. I was in desperate need of a nap to sleep off my sour mood. After waking up and feeling refreshed, we all walked into town for dinner. 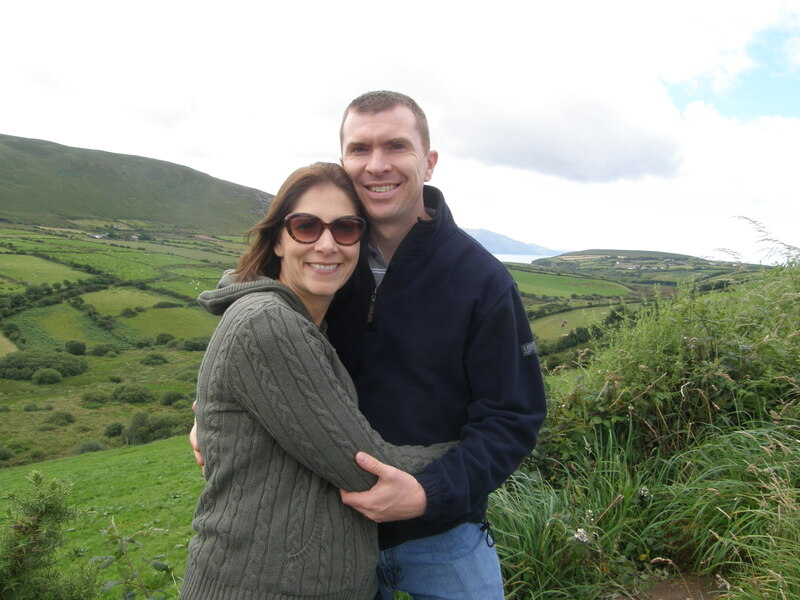 We walked by the Wild Geese Restaurant which was highly recommended by my colleague and we decided to give it a try. It was a very different dining experience because the hostess brought us into the “bar,” which was actually like a parlor room in a home. We all sat on the couch and she gave us our menus there and took our drink orders. She made our drinks right there at the small wood bar in the parlor and then she took our dinner orders. After our orders were placed, then we got seated at our dinner table. I have never seen it done like that before, but it was a fun experience and the food was really fabulous. After dinner we strolled on down to Bill Chawke’s Pub for drinks. It was a Saturday night and the place was packed! There was nowhere to sit inside the bar, but they had a lovely outdoor beer garden and we were able to get a table. In addition to enjoying our drinks, we were able to enjoy live music by some locals at a table nearby. 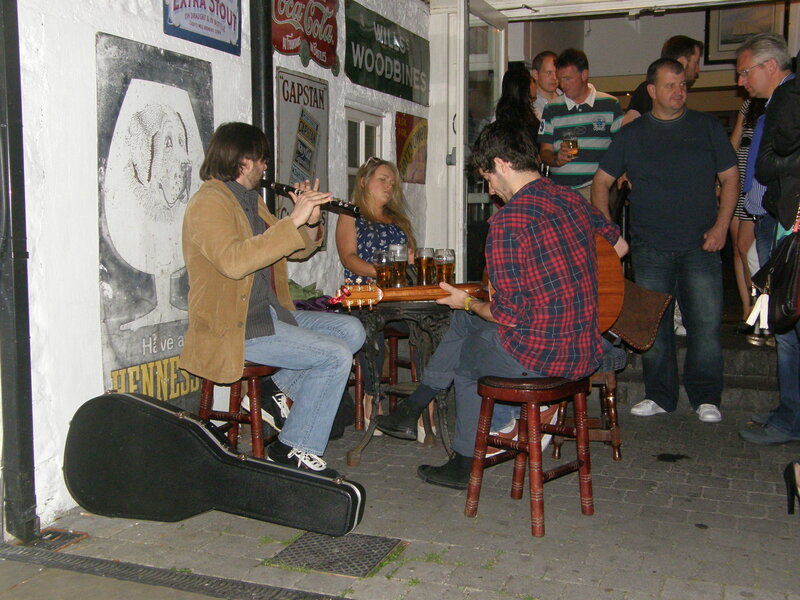 They weren’t hired entertainment; they just brought their instruments to the bar and started their own jam session. They were really good! Posted on August 3, 2012 by Dayna B. 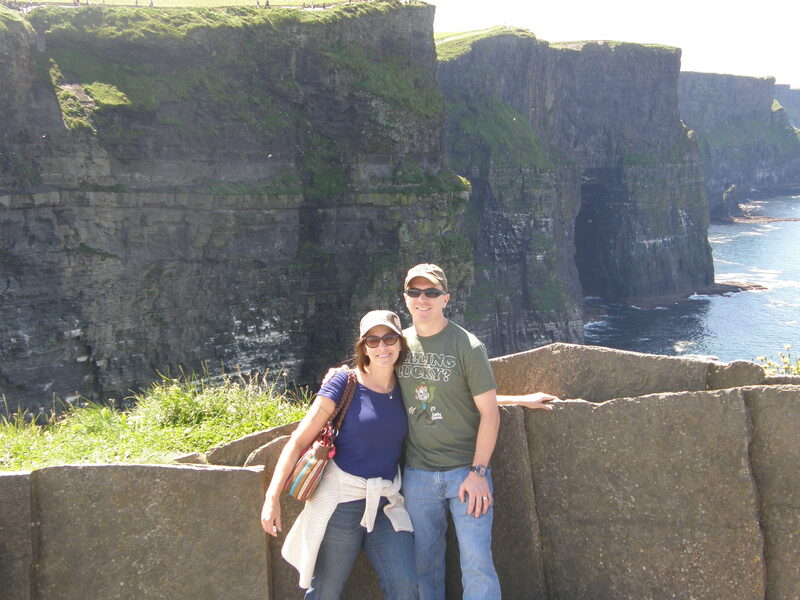 The next day we set off for the Cliffs of Moher, which was about 1 ½ hrs. 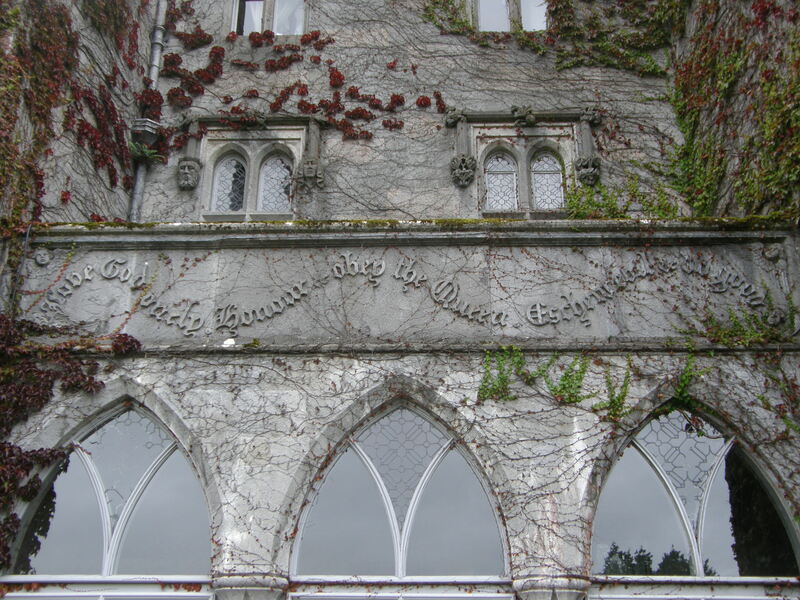 from Adare. 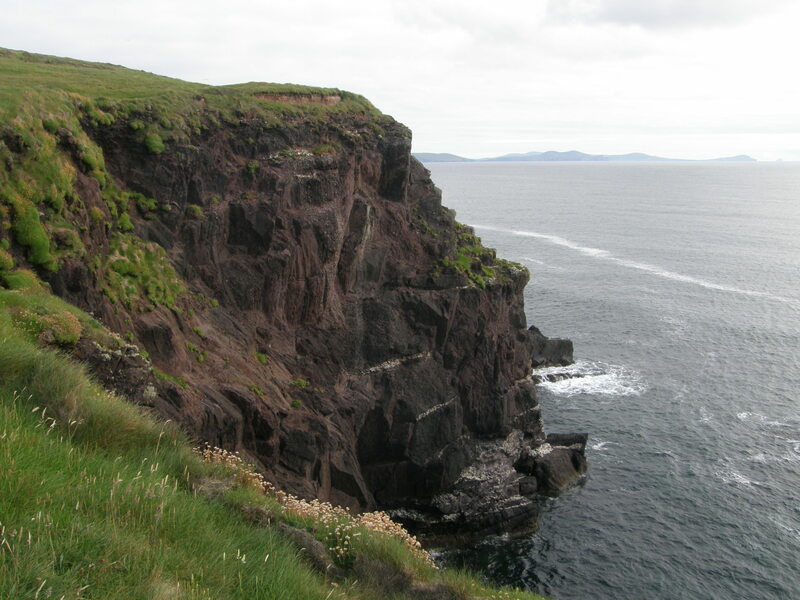 The cliffs were spectacular and a much bigger tourist hotspot than Dingle. 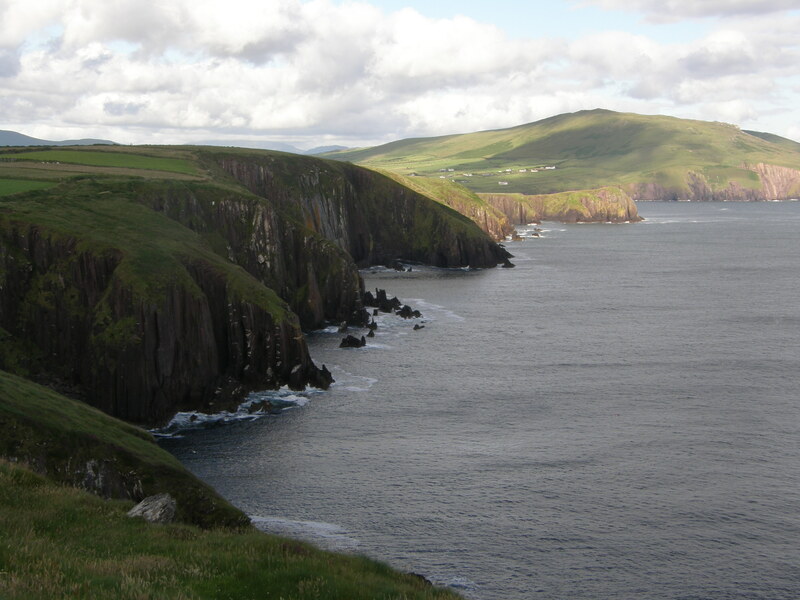 However, I think Dingle was slightly more breathtaking than the Cliffs of Moher. 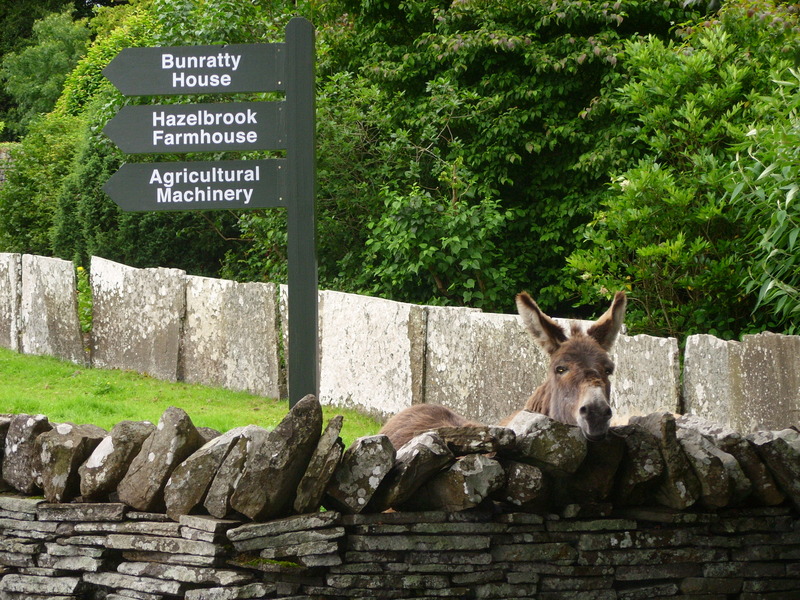 Either way, they are still a “must-see” during your visit to Ireland. 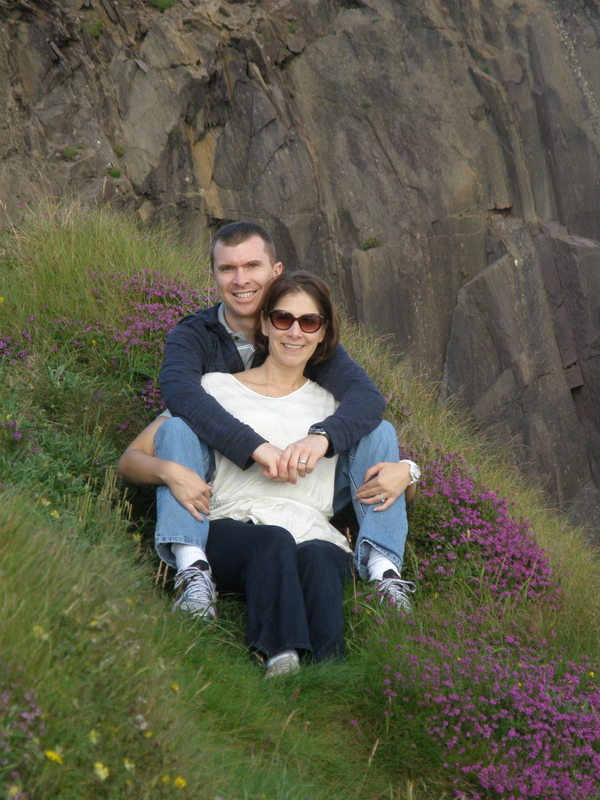 After leaving the cliffs we drove to a small seaside village called Doolin. 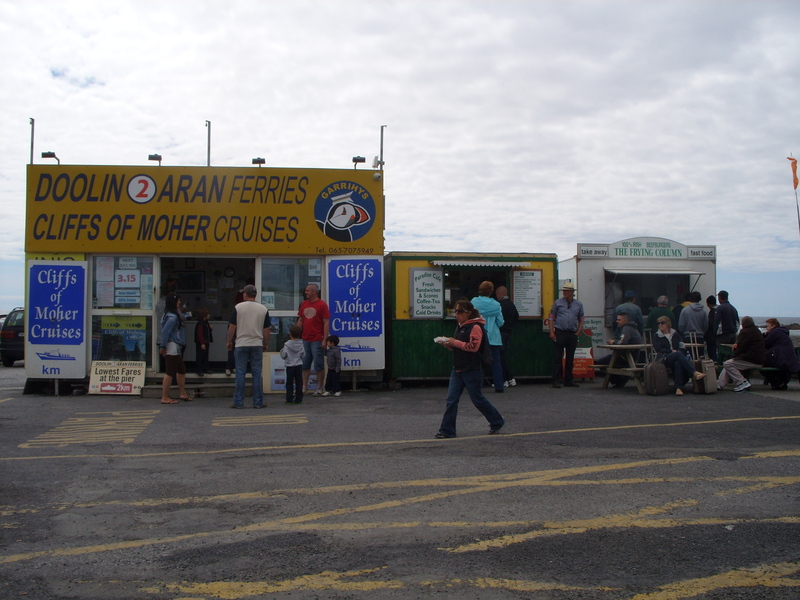 Doolin is a tourist hotspot because it offers ferry services to the Aran Islands as well as the Cliffs of Moher. 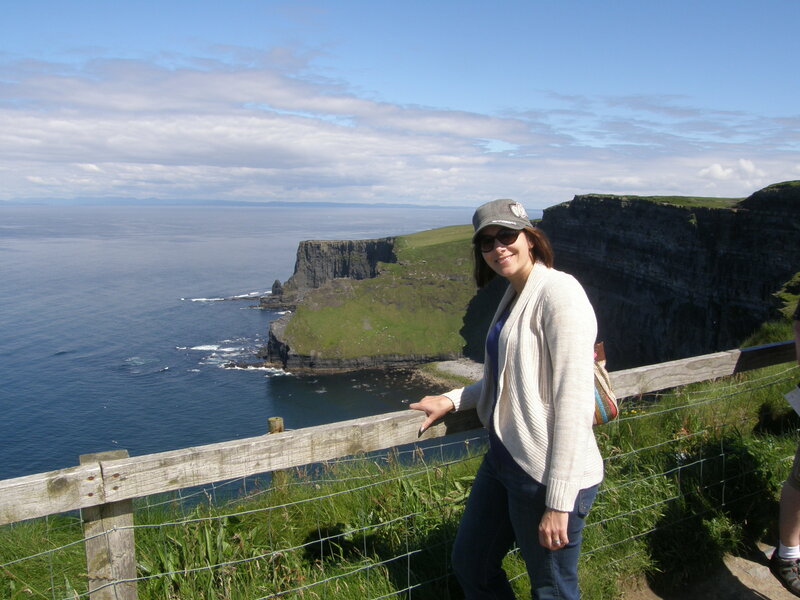 Winnie was really excited about taking a ferry to see the cliffs from the water, rather than only seeing them from above. But first, we had to eat! 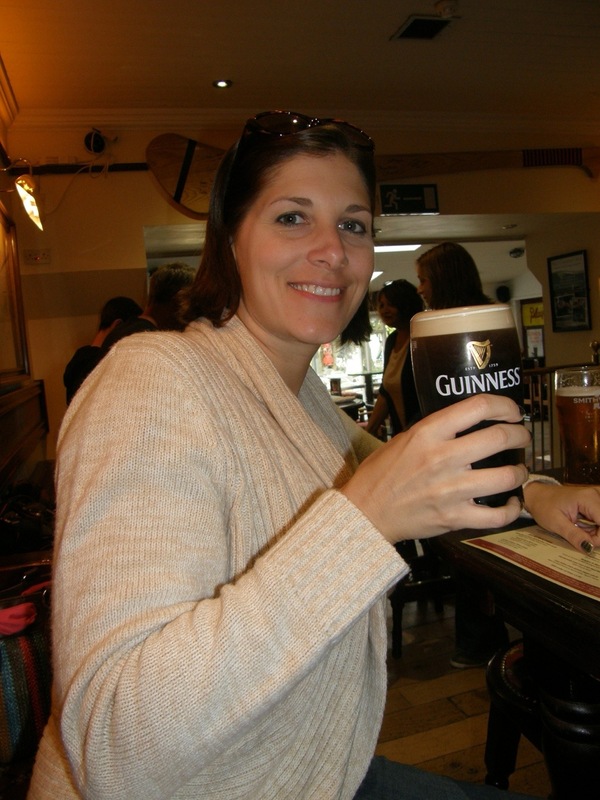 And what better place than Gus O’Connor’s Pub. 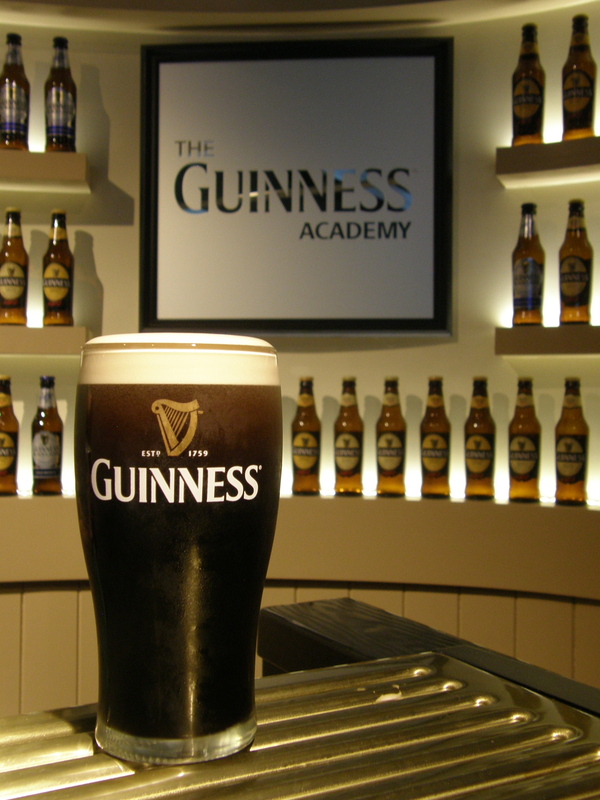 This pub is considered one of the best in Ireland and it has been owned and operated by the same family for 180 years! 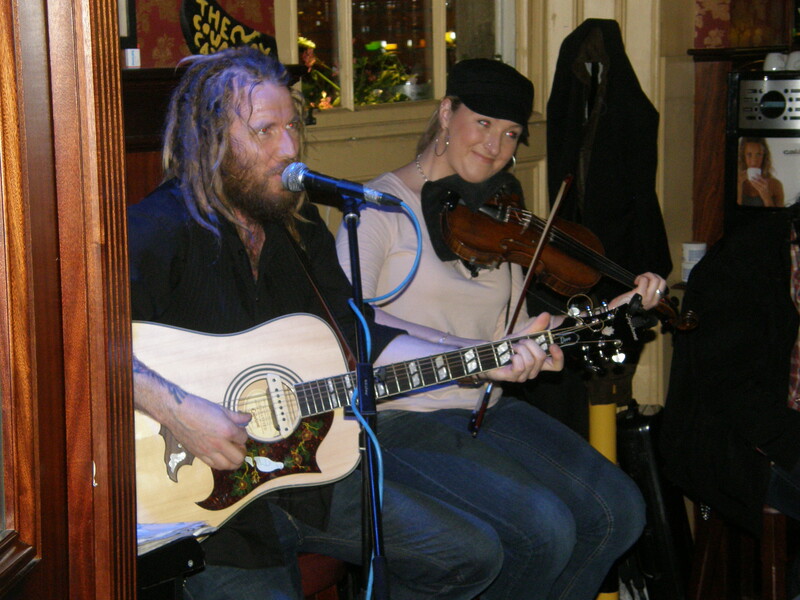 They are well known for their traditional Irish fare and live music. We were there too early in the day for music, but the food was fantastic. With bellies full, we went to the ferry dock and haggled for the best price. We had just missed the last ferry by about 10 minutes, so we had to hang around for about an hour for the next one. 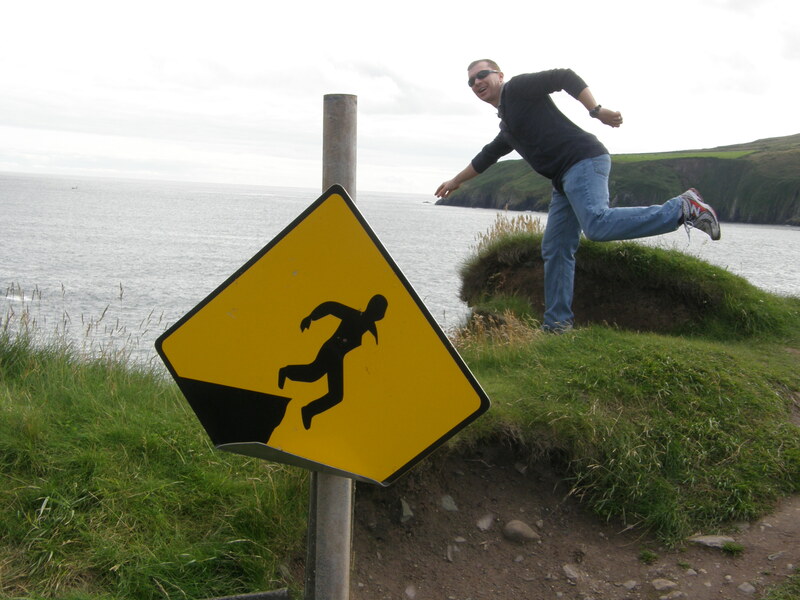 As soon as we got on the ferry I was worried that I might get seasick. I am pretty prone to seasickness and the water wasn’t exactly calm. Good news: I didn’t throw up my lovely lunch. Bad news: I was mildly nauseous for the rest of the day. But it was definitely worth it! 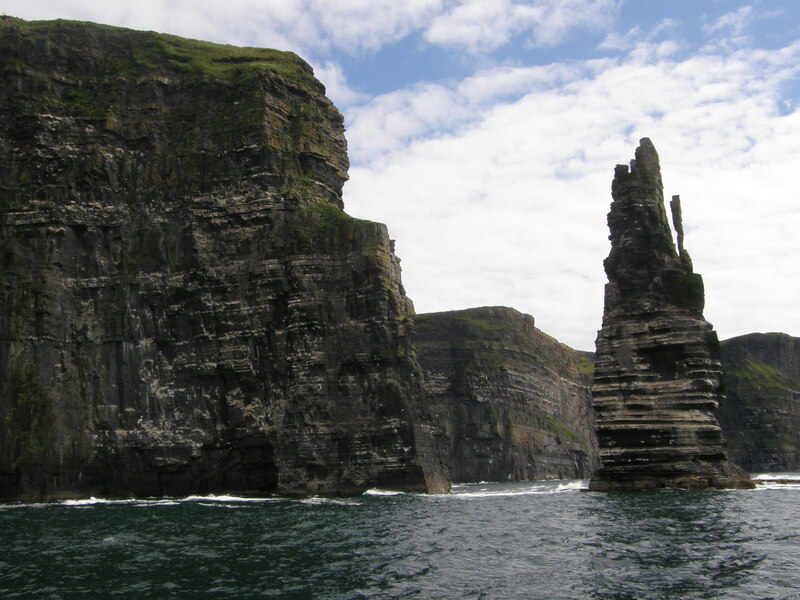 Most tourists only see the cliffs from above and it was a different experience entirely to see them from the water. 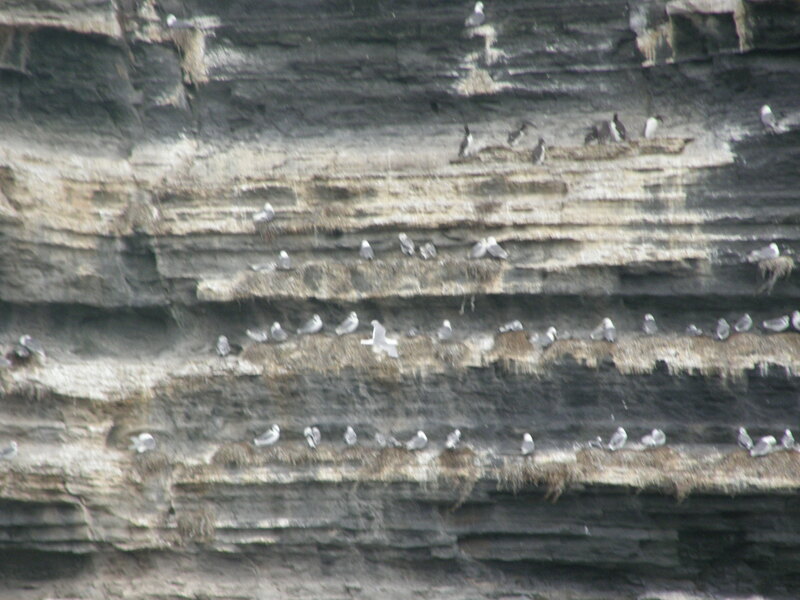 We also got to see a lot of puffins (as well as many other sea birds) around the cliffs. 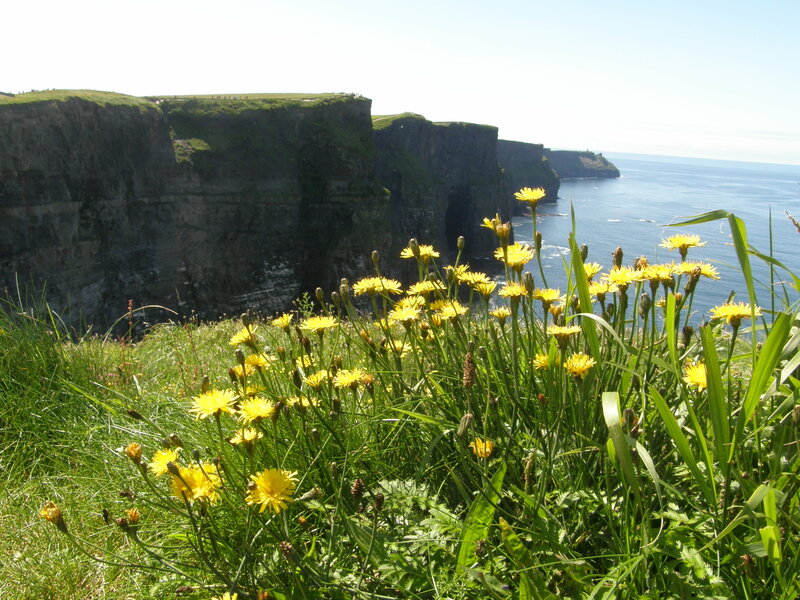 Apparently, the Cliffs of Moher hold the only mainland colony of breeding Atlantic Puffins in Ireland. 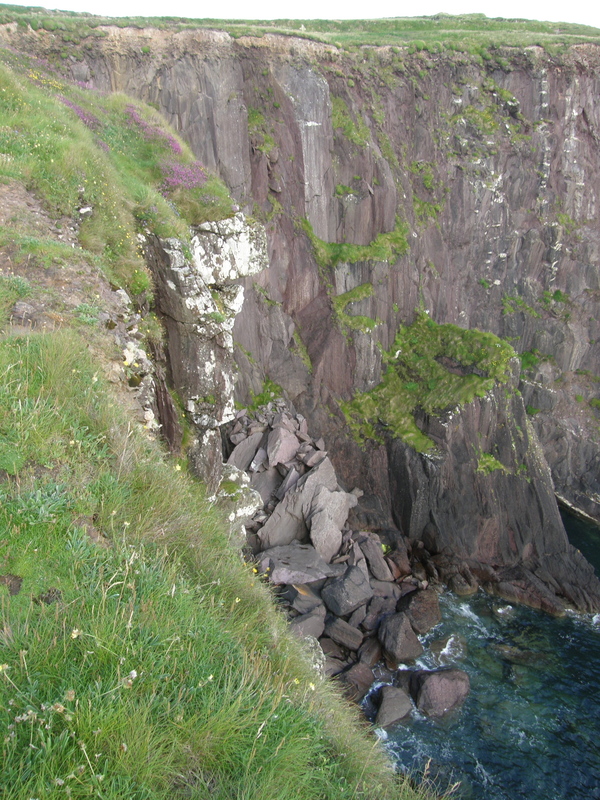 I wish I had a better (close-up) puffin photo op, but they are the ones in the upper right corner in the picture of the edge of the cliff. 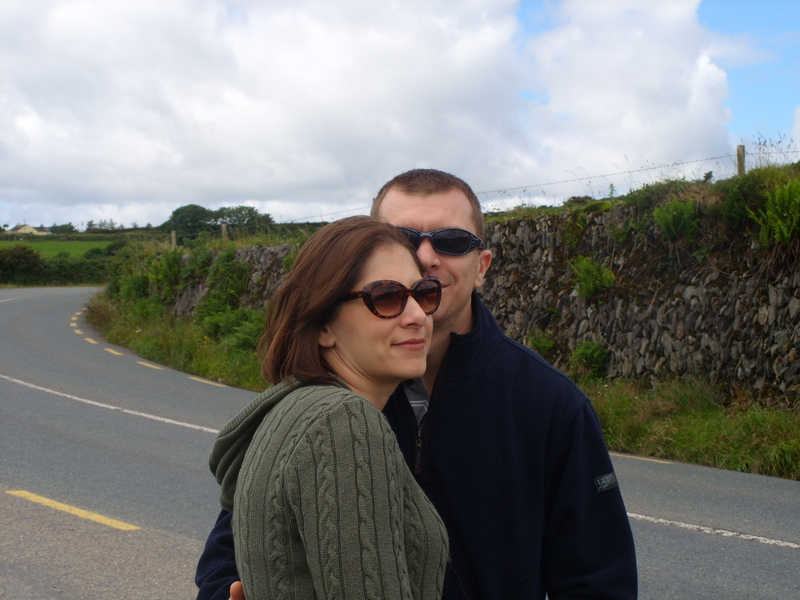 After our ferry ride we headed back to Adare. 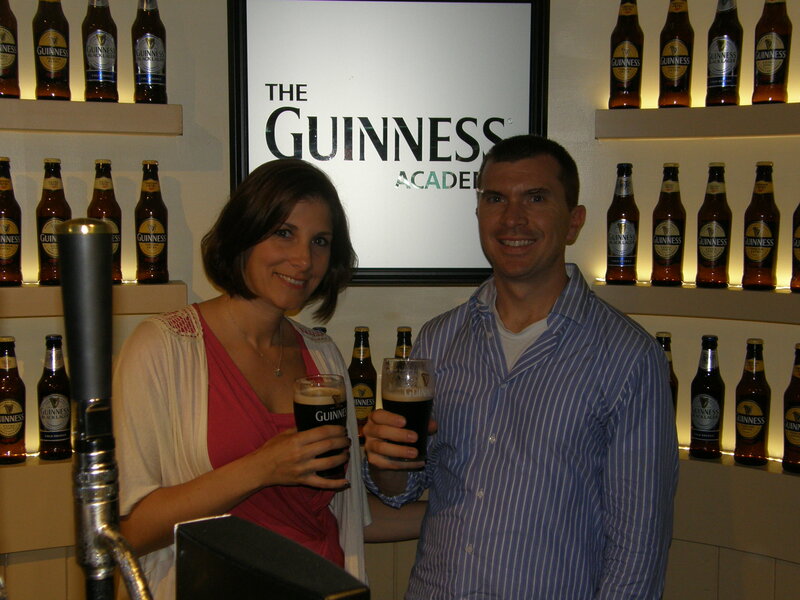 We strolled around town and then began our very own pub crawl. 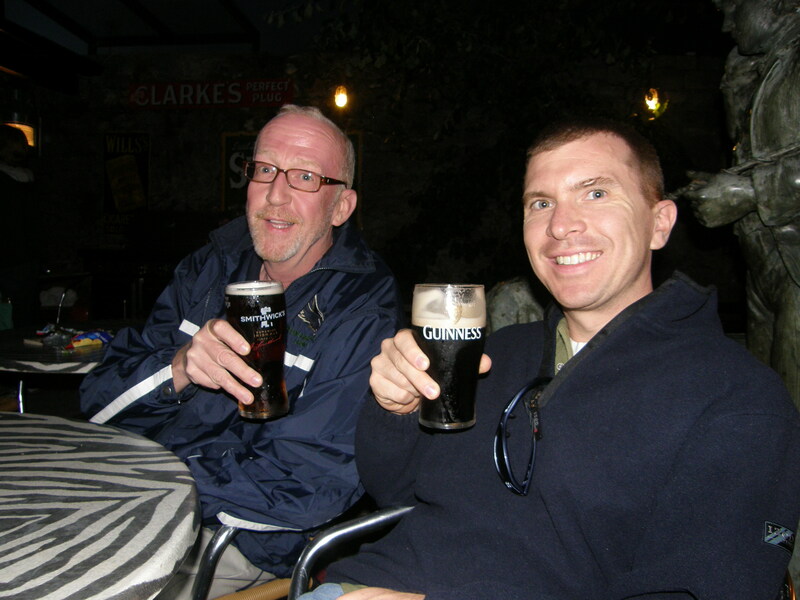 We had an extended stop at Bill Chawkes Pub for dinner and then we continued the pub crawl. On our walk back to the manor, I am pretty sure Winnie and I crashed a wedding reception to use the bathroom! 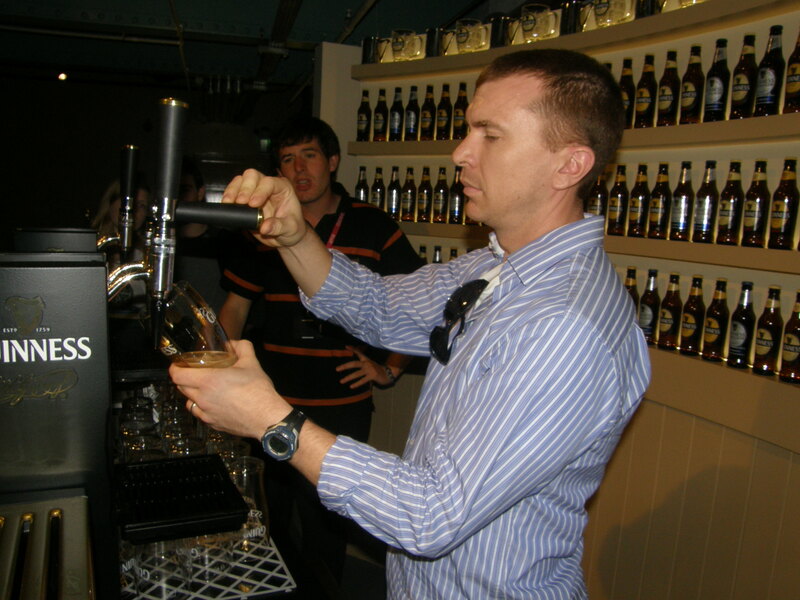 Too much Guinness I guess. Posted on August 2, 2012 by Dayna B. 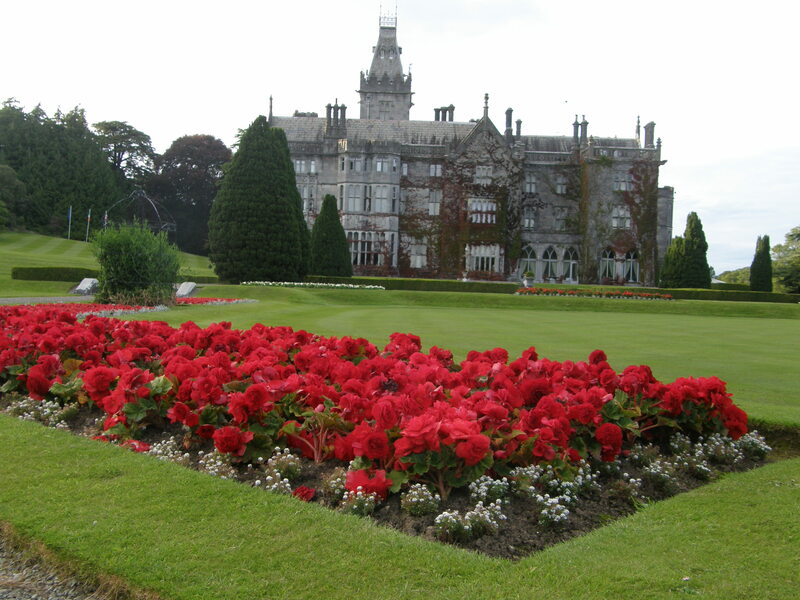 We started our day off with a full Irish breakfast at Adare Manor and then we were on our way to the Dingle Peninsula. It was a fairly long car ride, but the countryside views were amazing. We had to stop along the way for some great photo ops. 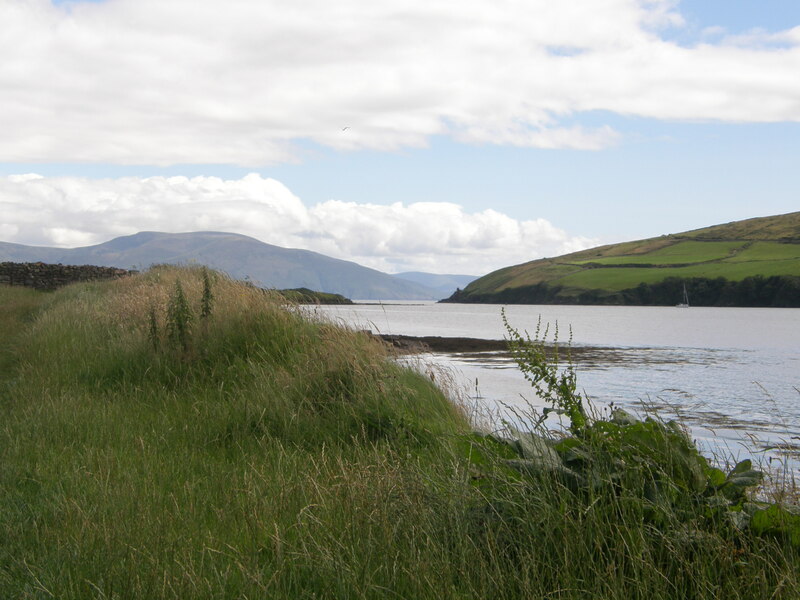 Upon our arrival in Dingle we were on the hunt for the best fish and chips and the best seafood chowder in town. 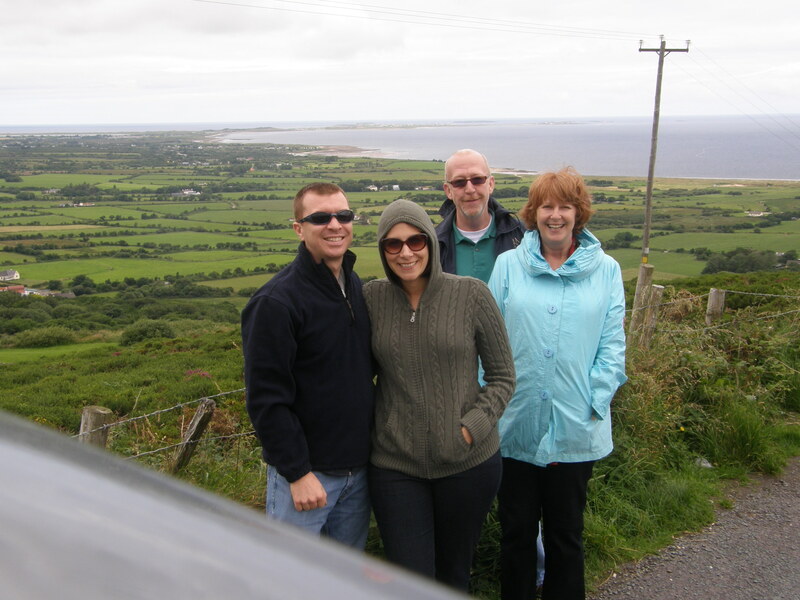 Winnie’s friends were recently in Ireland and they assured us that Reel Dingle Fish was the best fish and chips in town and the Half Door Restaurant had the best seafood chowder in town. 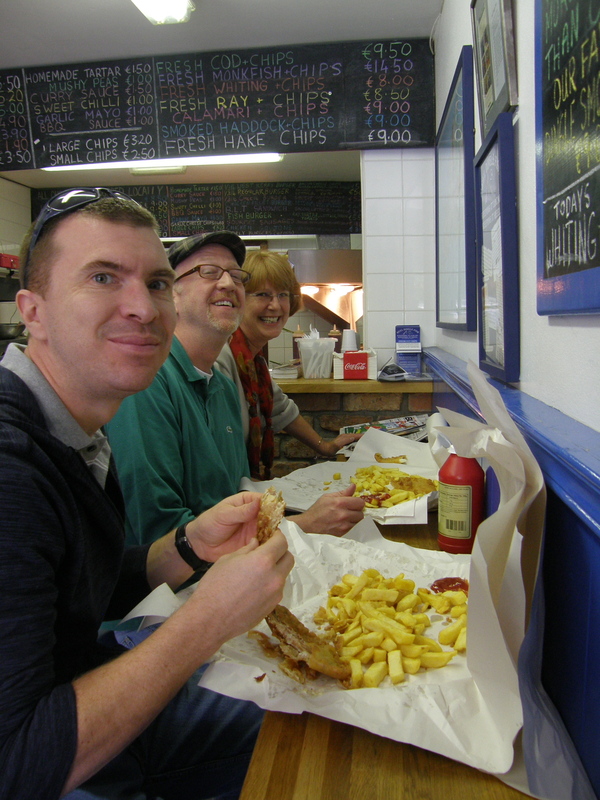 Rob, Tom and Winnie all enjoyed their fish and chips, but I took a pass on this meal because I was looking forward to the seafood chowder. 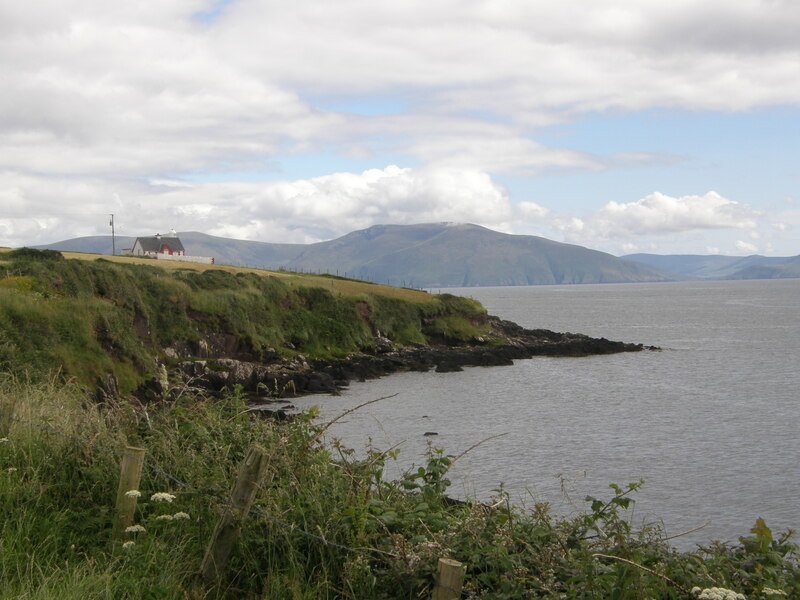 The owner of Reel Dingle Fish gave us a wonderful tip about a walking trail along the peninsula with some breathtaking views. We thanked him for the tip and then we headed to the Half Door Restaurant so I could try the best chowder in town. Delish! 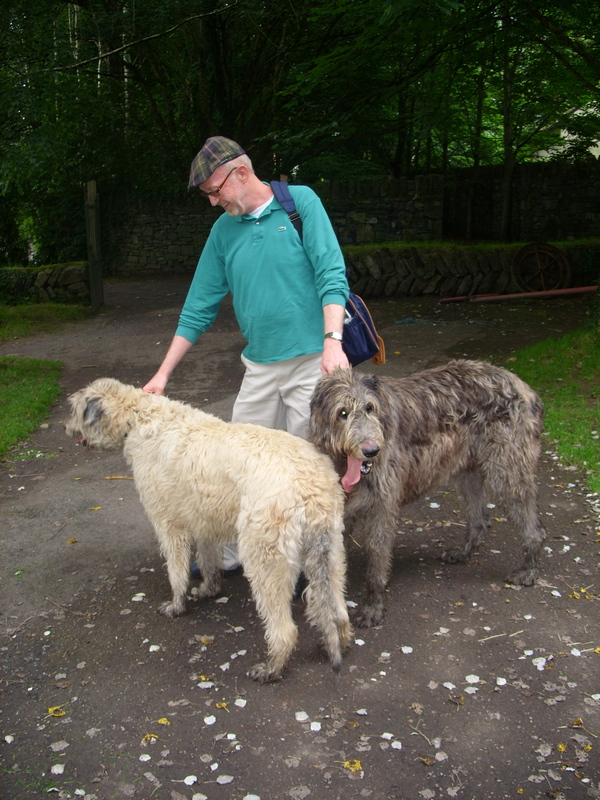 Rob, Winnie & I set off on our hike while Tom hung back to do some shopping in town. At the very beginning of the trail we spotted a seal toying with a fish. 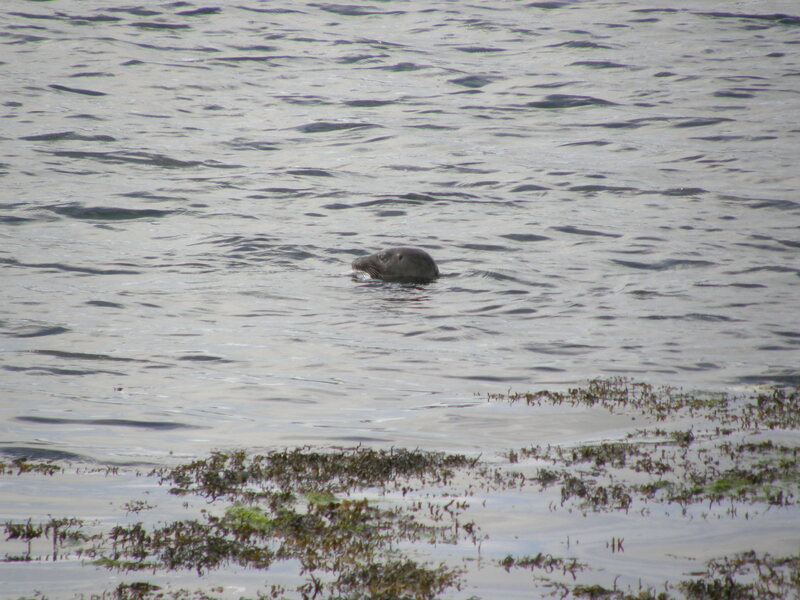 A bystander assured me it was an otter, but I knew it was a seal. Anyway, the trail was beautiful and we were all just soaking in the scenery. The hike was taking a bit more time than we anticipated so we decided to turn around before reaching the spot suggested by the local. We had agreed to meet Tom at a specific time back at the car so we didn’t want to keep him waiting if we pushed on through the rest of the way. 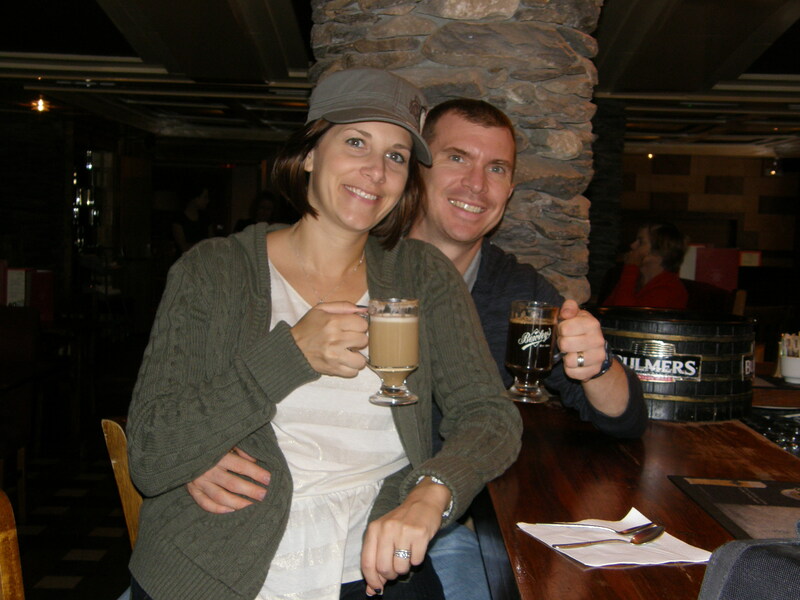 The whole group was complete once again and we popped into a pub for some Irish coffees and Bailey’s coffees. 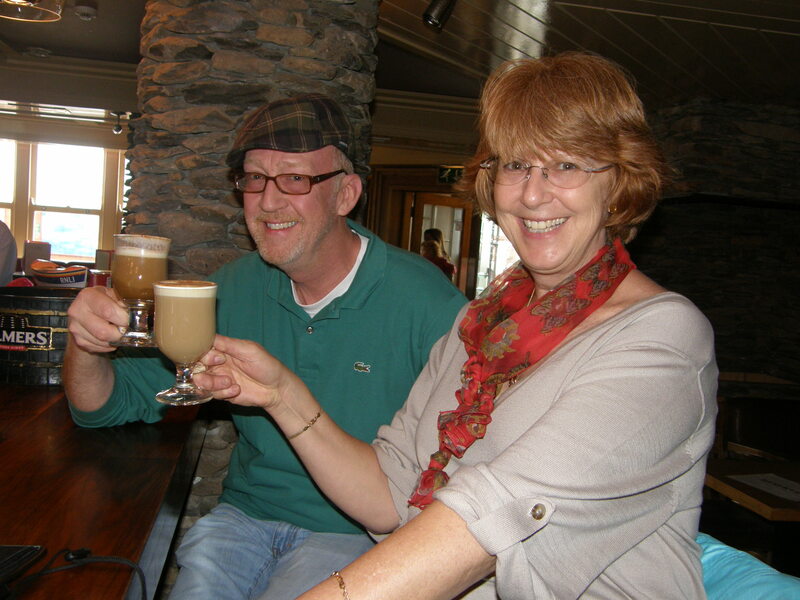 Winnie had never had a Bailey’s coffee before, but as you can see she is quite happy with it! Our fearless navigator (McRobert) found a way to drive us to the place we had to end our hike earlier that afternoon, so we were able to park there and then finish the last ¼ of the trail. This was a super idea because Tom got to do his shopping earlier in the day and still take part in the last leg of the hike which had the best views anyway. The landscapes and scenery were just amazing. 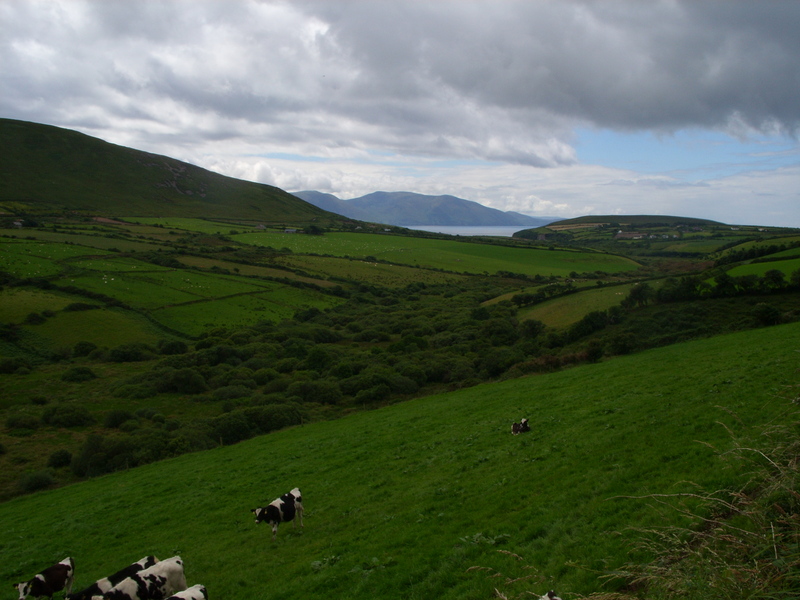 I definitely took more pictures in Dingle than anywhere else during the trip. Here are just a few of them. 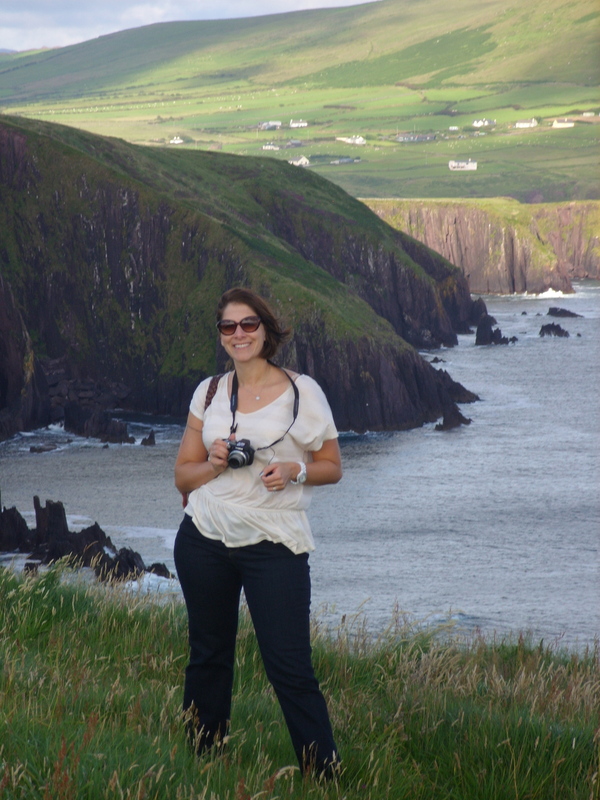 After the hike (and photo sessions) were complete we hopped in the car and headed back to Adare, stopping somewhere along the way for a light dinner. It was shocking when I realized what time it was when we got home. We arrived at the villa at about 10:30 p.m. and the sun had just gone down about 30 minutes prior. 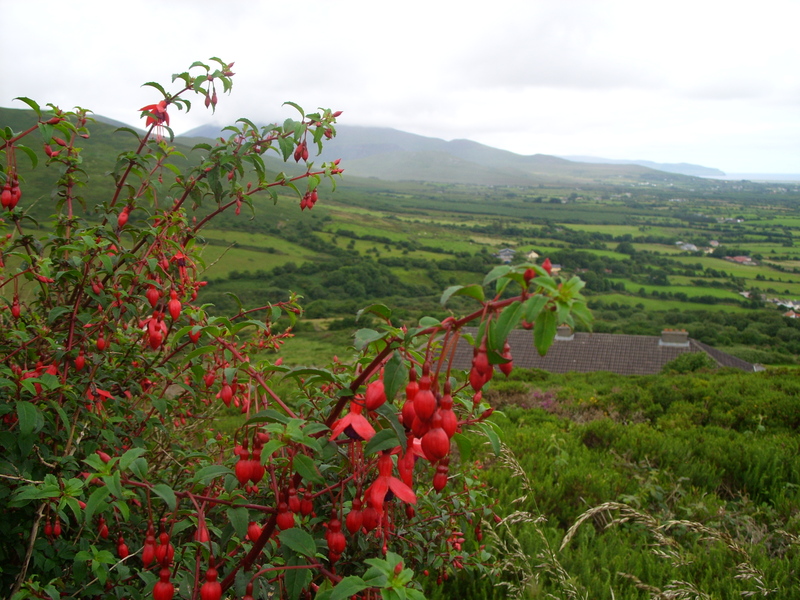 Apparently, the days are extremely long in Ireland in July. 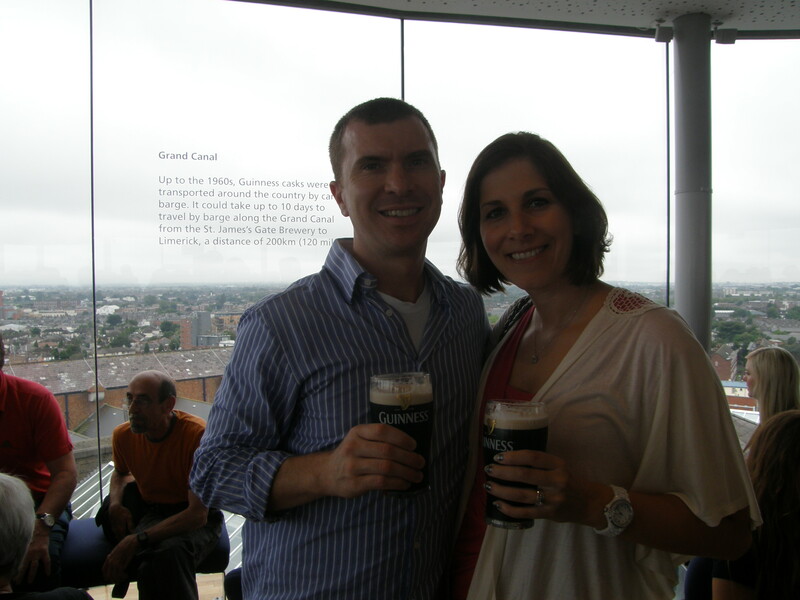 Our journey to Ireland began with a red-eye flight from Dulles to Dublin and I have to admit I was more than excited about our nonstop flight! To ensure that I would be able to sleep on the plane (and hopefully minimize jet lag) I prescribed the following: 1 rum & coke followed by 2 Benadryl. Worked like a charm! I was pretty much out for the entire flight and didn’t wake up until they began serving our morning snack. I definitely slept more than my travel companions (more on this later). 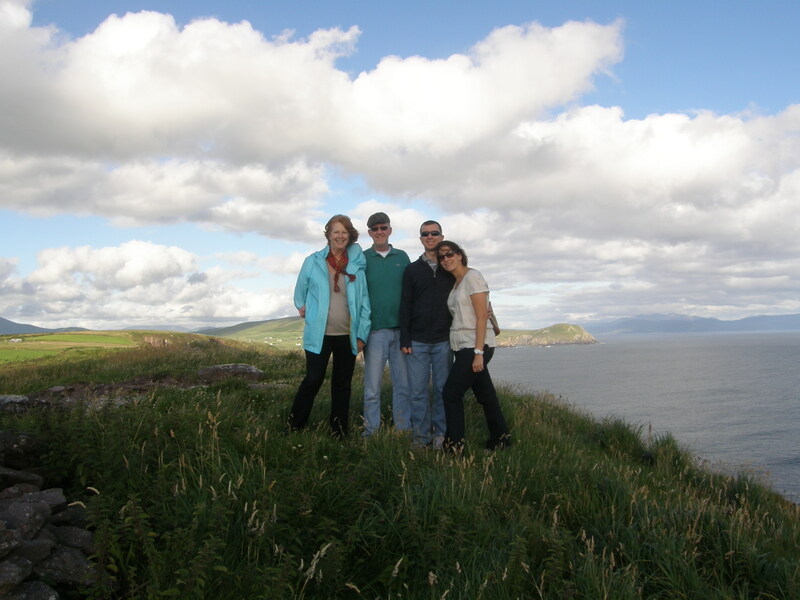 Upon our arrival, we were all more than delighted about the weather conditions in Ireland. It was a cool 65 degrees and it felt absolutely amazing to be out of the heat wave back home (up to 110 degrees!). We picked up our rental car from Dan Dooley. After some lengthy modifications to vehicle size and insurance coverage, we were on the road! Prior to our trip, all of our friends and colleagues tried to convince us to upgrade to an automatic transmission. They assured us that paying extra for the automatic was essential to navigating successfully around the island. Not only do you have to deal with driving on the left (a.k.a. 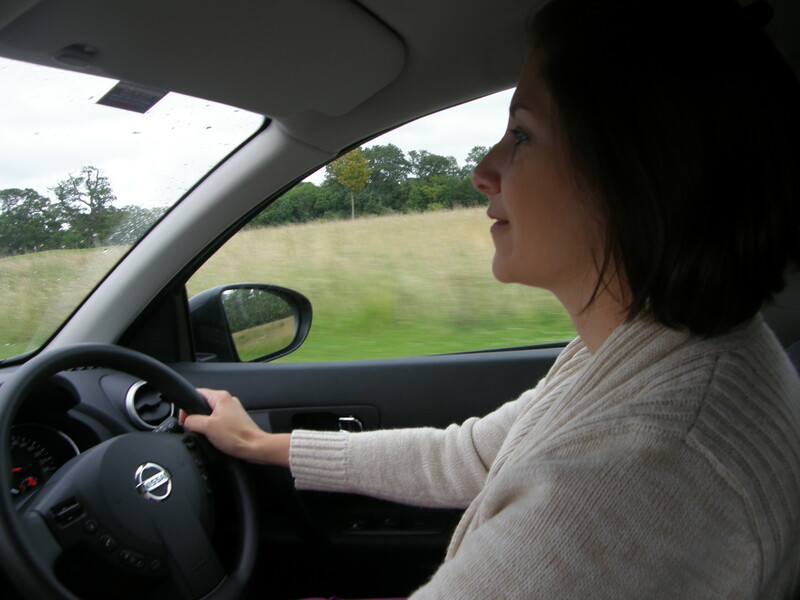 “wrong”) side of the road, but you also have to drive with the steering wheel on the right side of the car, which means you have to change gears with your left hand. We ignored all of their warnings and went rogue with a manual transmission! 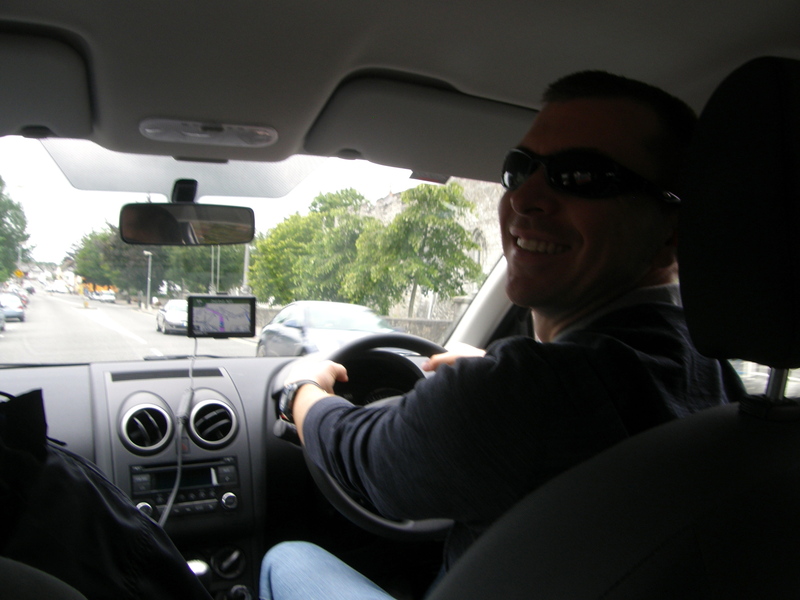 Rob proved to be a masterful driver and we were happy to save some cash on our rental that could later be applied to Guinness. 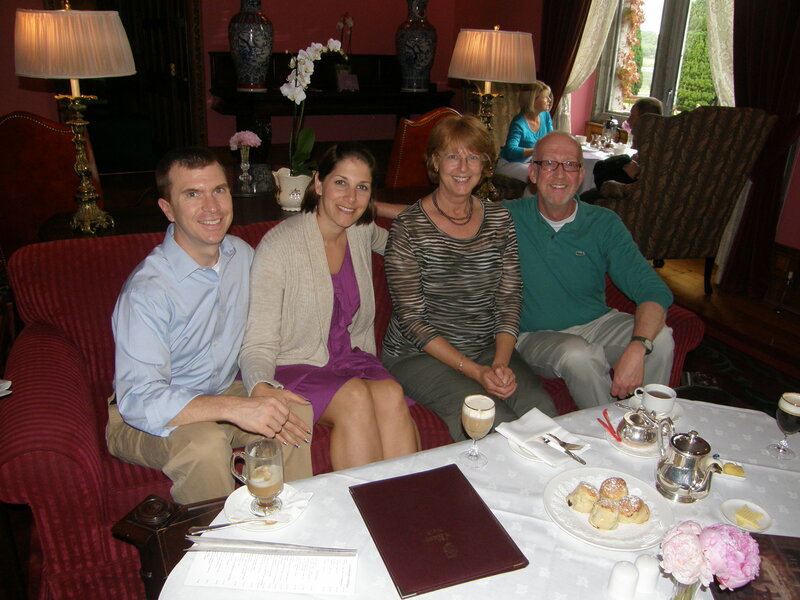 The drive from Dublin to Adare is about 2 ½ hours, so we stopped along the way for lunch. 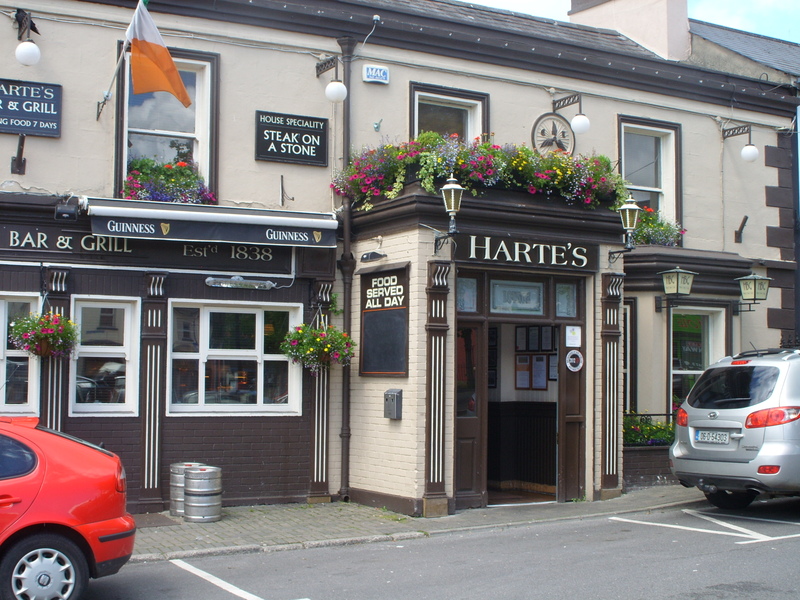 We stopped in a cute little town called Kildare and everyone took the opportunity to withdraw some euros from the ATM and then we had a really nice lunch at Harte’s Pub. After a short delay trying to figure out how to put the car in reverse, we were on our way again! 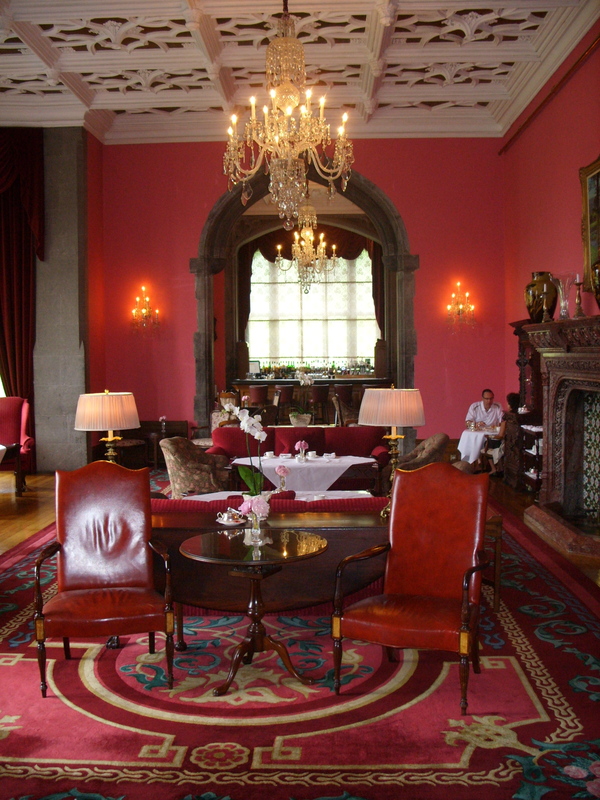 We arrived in Adare in good time and then we checked-in to Villa 35. Our accommodations were superb and everyone seemed quite pleased with the arrangement. 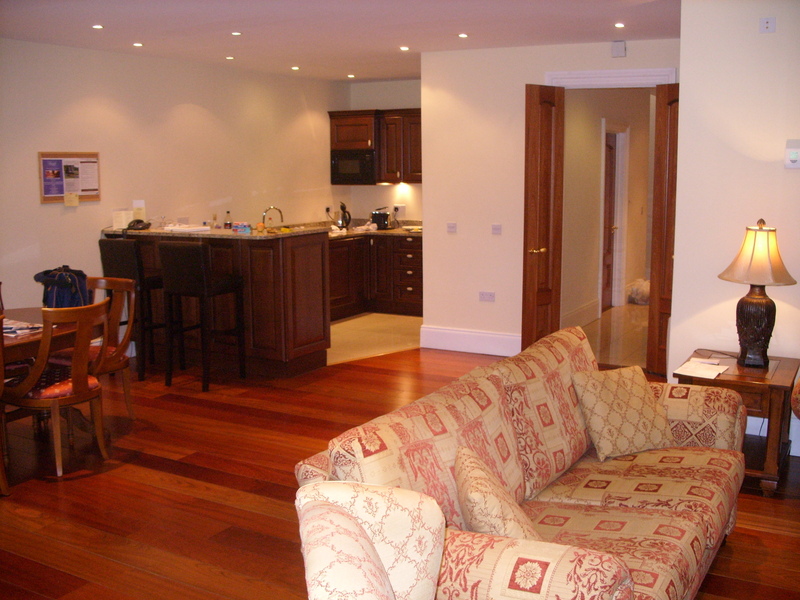 The best part was that each of the 3 bedrooms had its own adjoining bathroom. The villa had a full kitchen so we decided to go to the grocery store in town to pick up a few essentials (a.k.a. booze) and some food to cook for dinner since we were all way too exhausted to go out. After the shopping was complete, Rob, Winnie & Tom couldn’t fight the good fight any longer (they did not adhere to my prescription above) and all took naps. I was forcing myself to stay awake so that I would be able to sleep through the night and hopefully feel refreshed in the morning. Luckily, our villa had wi-fi so I was able to occupy myself on Netflix in order to stay awake while everyone else was sleeping. We had a relaxing, low key evening and everyone was ready to get some rest and start touring around the country the following day.